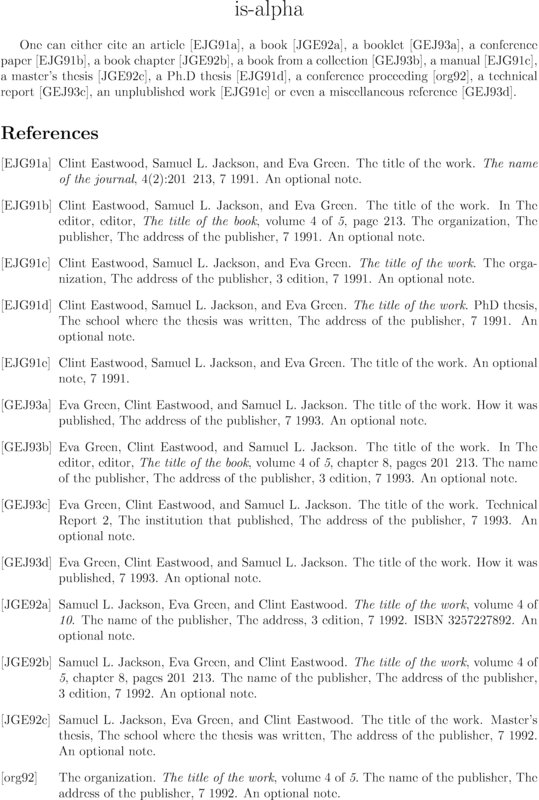 Report an error achemso Author-year citing order comma Lastname, F.
Report an error acm Numerical alphabetical Lastname, F.
Report an error agsm Author-year alphabetical none Lastname, F.
Report an error alpha-letters Abbreviation alphabetical Lastname, F.
Report an error apa Author-year alphabetical none Lastname, F.
Report an error apalike Author-year alphabetical comma Lastname, F.
Report an error apalike-letters Author-year alphabetical comma Lastname, F.
Report an error apalike2 Author-year alphabetical comma Lastname, F.
Report an error astron Author-year alphabetical comma Lastname, F.
Report an error bbs Author-year alphabetical none Lastname, F.
Report an error cbe Author-year alphabetical none Lastname, F.
Report an error cell Author-year alphabetical comma Lastname, F.
Report an error chicago Author-year alphabetical comma Lastname, F.
Report an error chicago-annote Author-year alphabetical comma Lastname, F.
Report an error chicagoa Author-year alphabetical comma Lastname, F.
Report an error cpc Numerical citing order Lastname, F.
Report an error dcu Author-year alphabetical semicolon Lastname, F.
Report an error dk-apali Author-year alphabetical comma Lastname, F.
Report an error dk-plain Numerical citing order Lastname, F.
Report an error frplainnat-letters Author-year alphabetical comma Lastname, F.
Report an error humanbio Author-year alphabetical none Lastname, F.
Report an error humannat Author-year alphabetical none Lastname, F.
Report an error iaea Numerical citing order Lastname, F.
Report an error ijqc Numerical citing order Lastname, F.
Report an error iopart-num Numerical citing order Lastname, F.
Report an error jas99 Author-year alphabetical comma Lastname, F.
Report an error jmb Author-year alphabetical comma Lastname, F.
Report an error jneurosci Author-year alphabetical comma Lastname, F.
Report an error munich Author-year alphabetical comma Lastname, F.
Report an error nar Numerical citing order Lastname, F.
Report an error newapa Author-year alphabetical comma Lastname, F.
Report an error nf Numerical citing order Lastname, F.
Report an error nflet Numerical citing order Lastname, F.
Report an error perception Author-year alphabetical comma Lastname, F.
Report an error phcpc Numerical citing order Lastname, F.
Report an error phiaea Numerical citing order Lastname, F.
Report an error plain-letters Numerical alphabetical comma Lastname, F.
Report an error plainnat-letters Author-year alphabetical comma Lastname, F.
Report an error ppcf Author-year alphabetical comma Lastname, F.
Report an error regstud Author-year alphabetical comma Lastname, F.
Report an error worlddev Author-year alphabetical comma Lastname, F.
Looking for a BibTeX style which perfectly fits your needs? 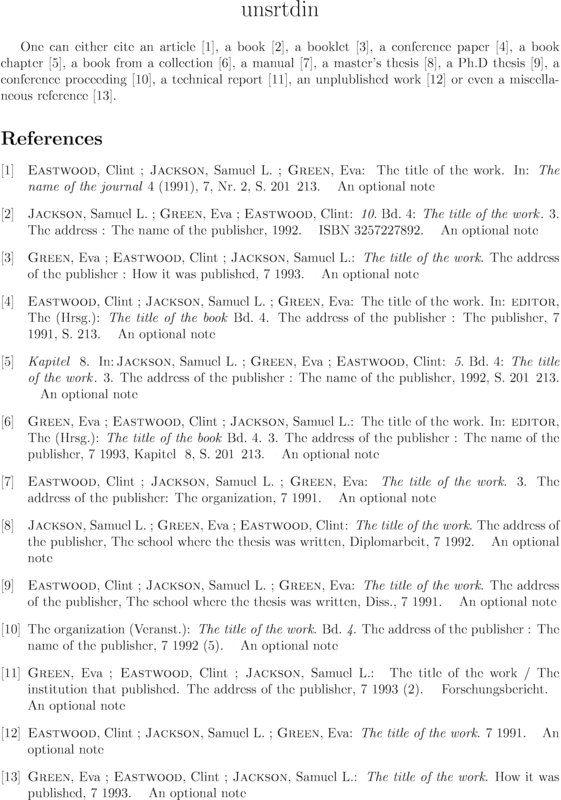 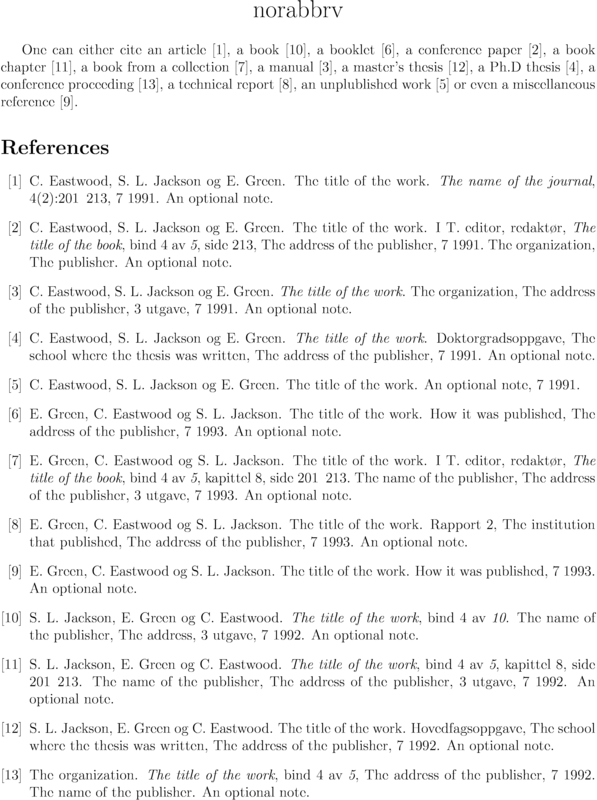 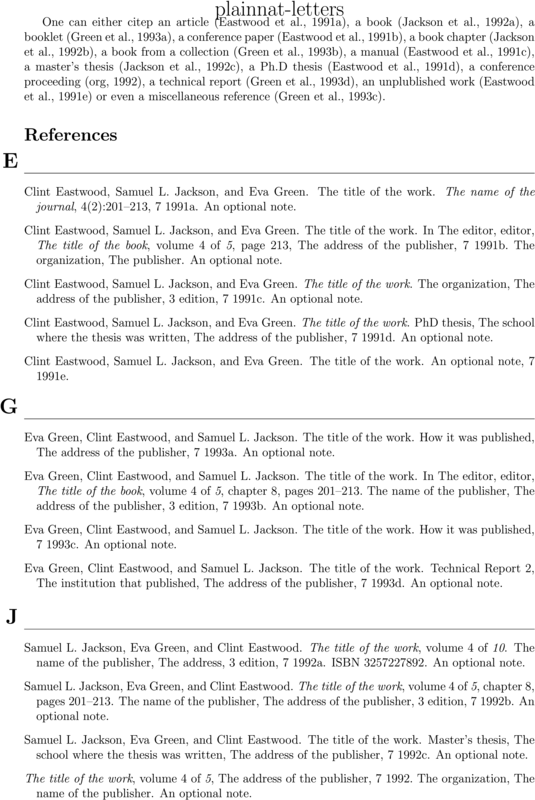 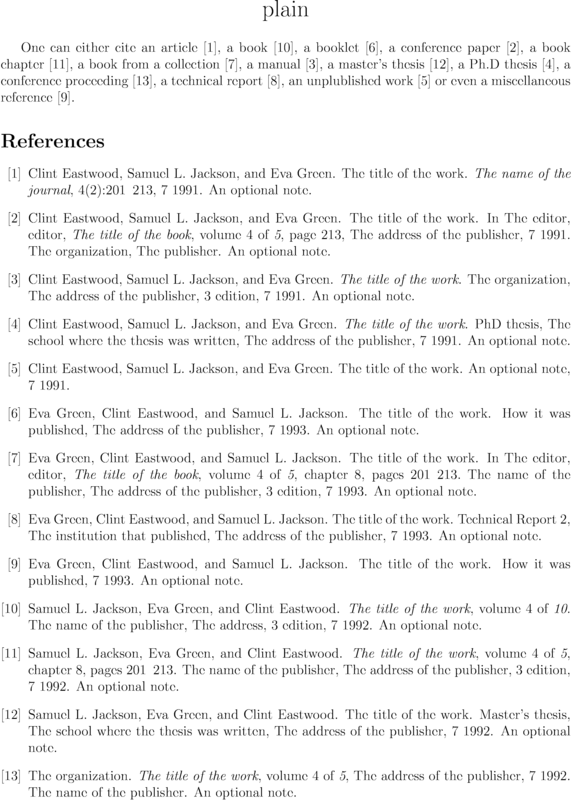 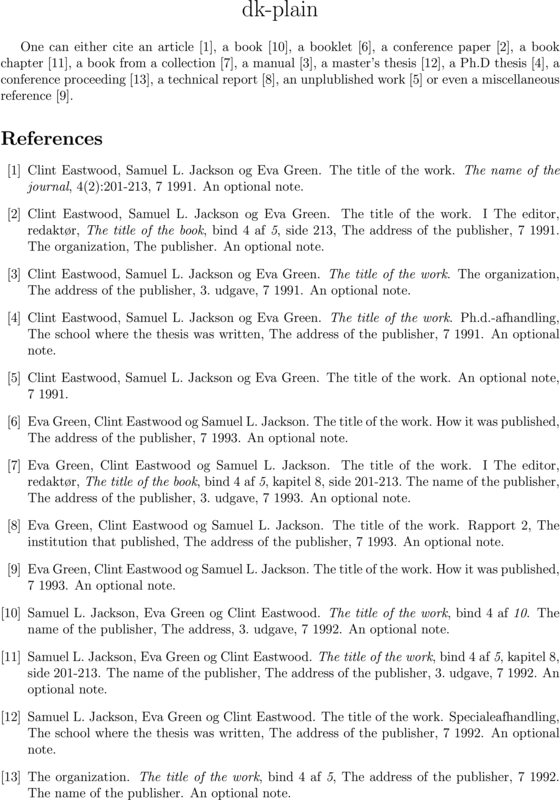 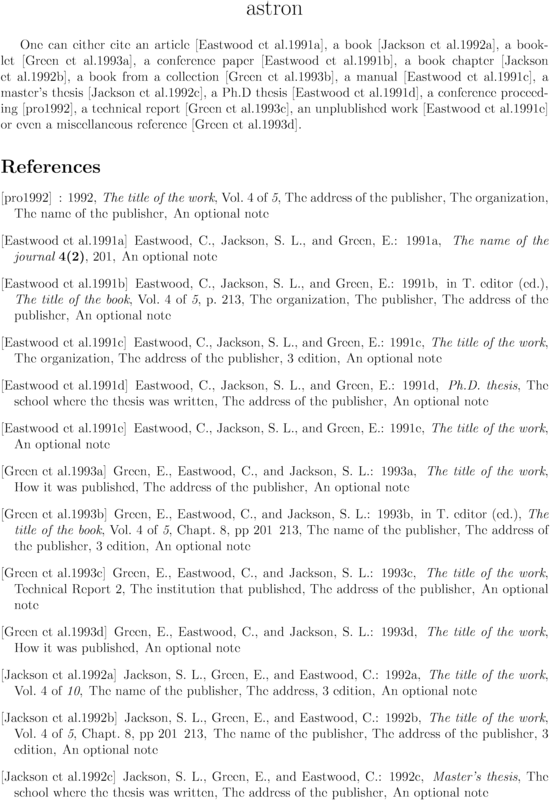 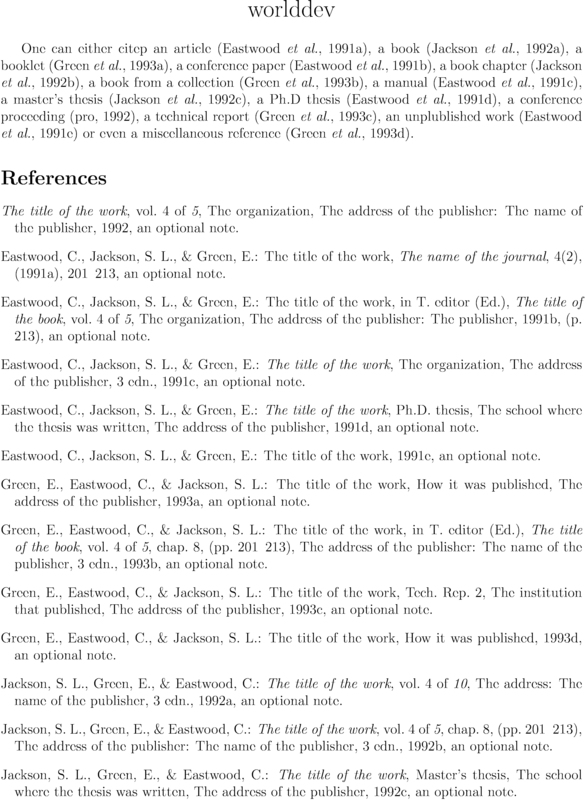 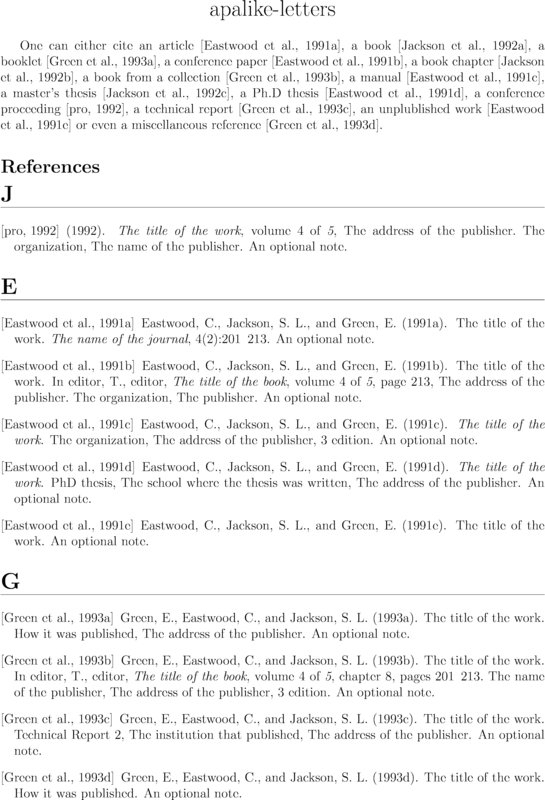 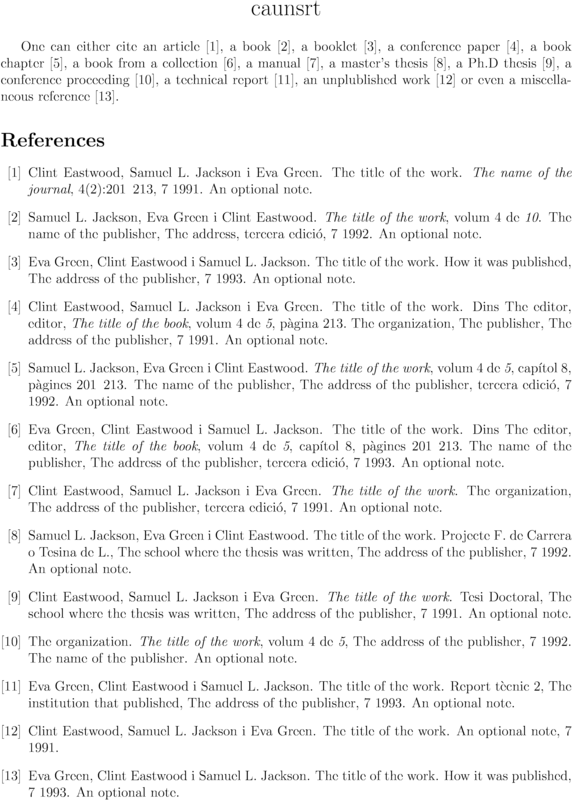 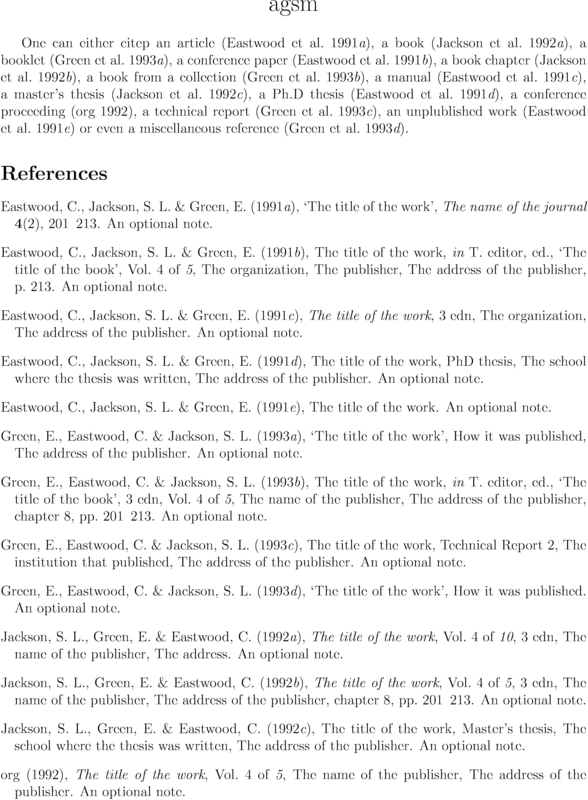 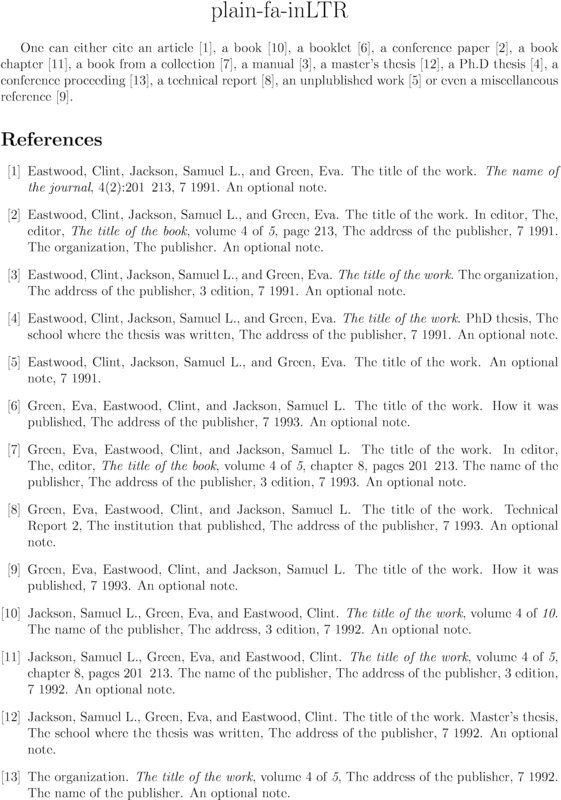 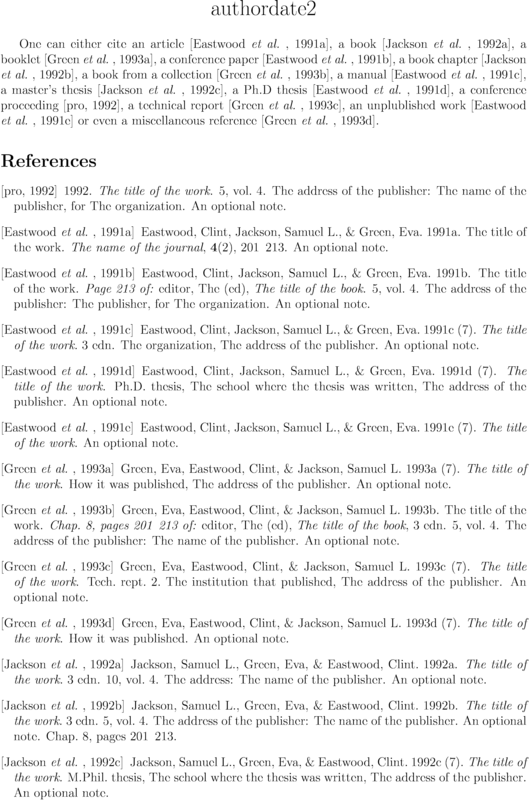 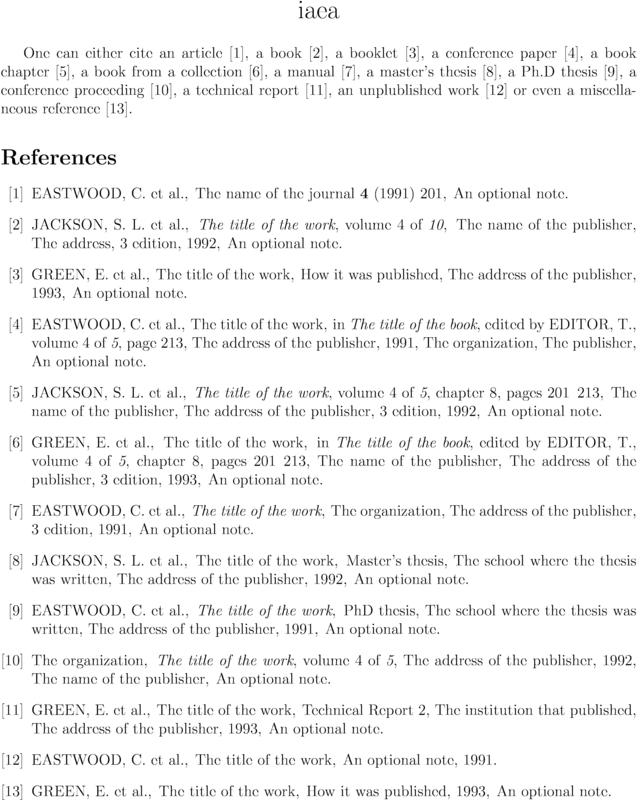 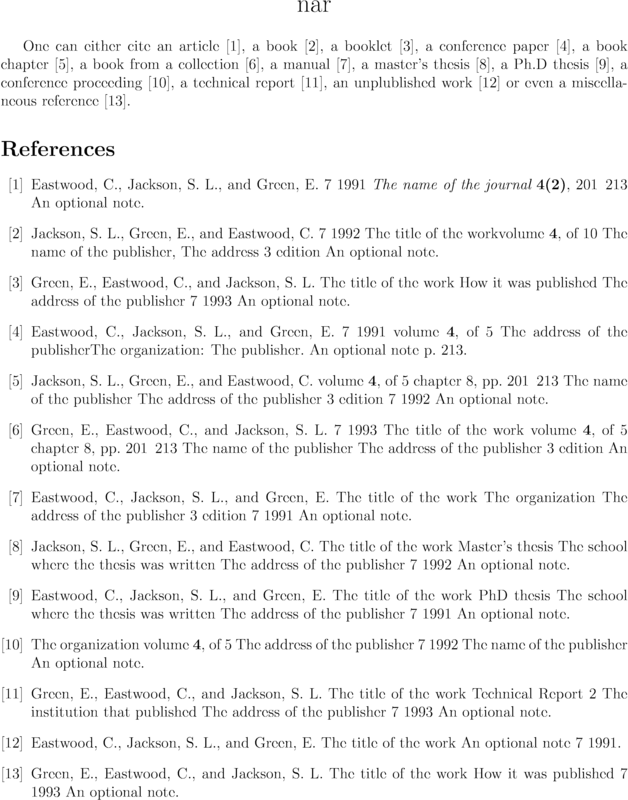 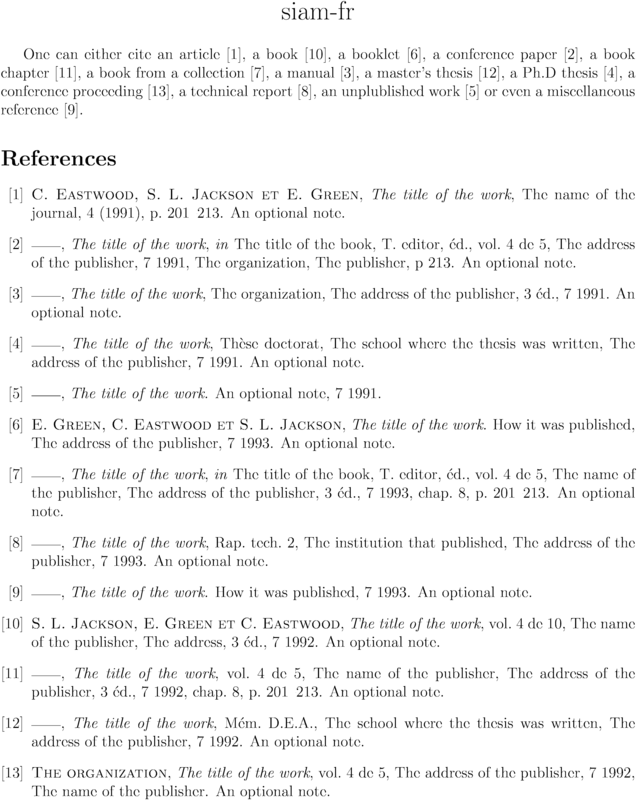 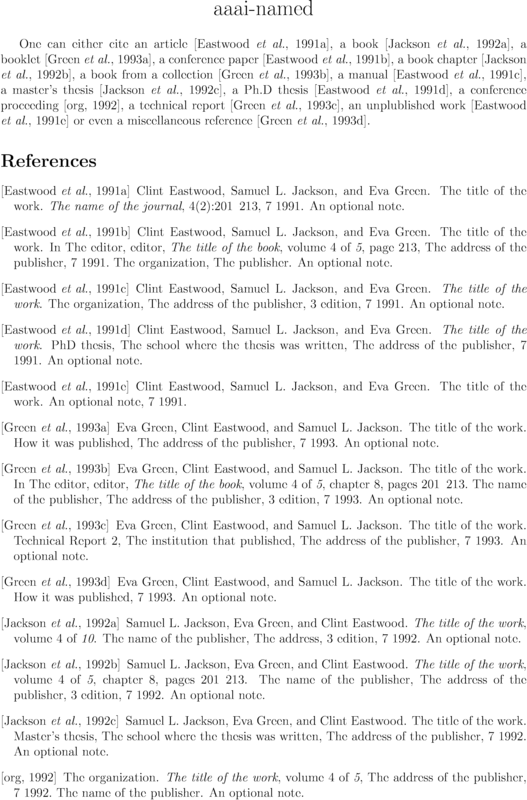 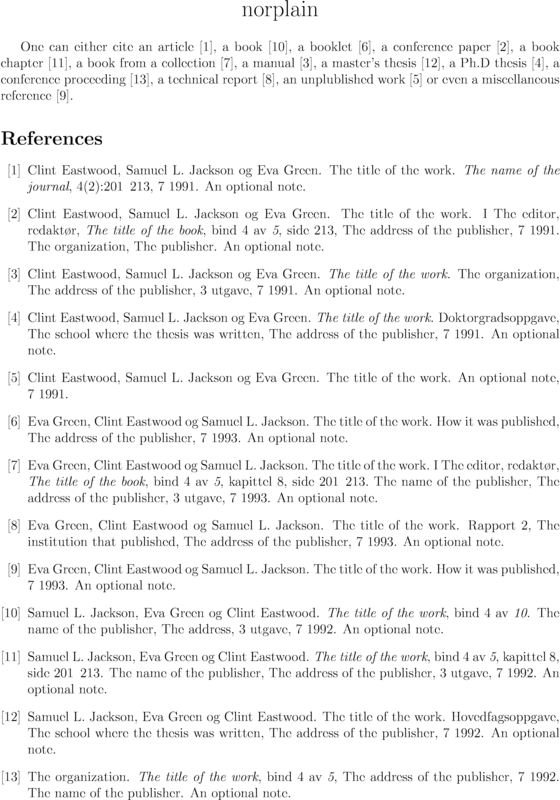 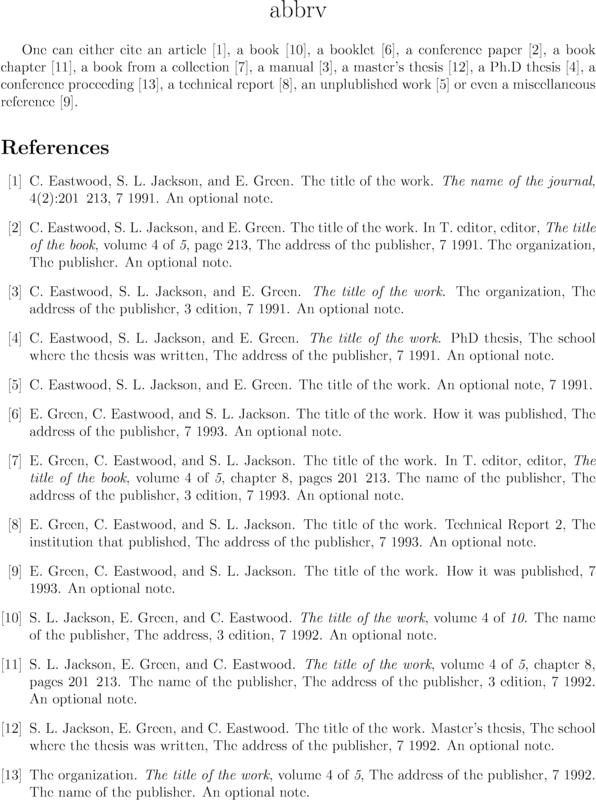 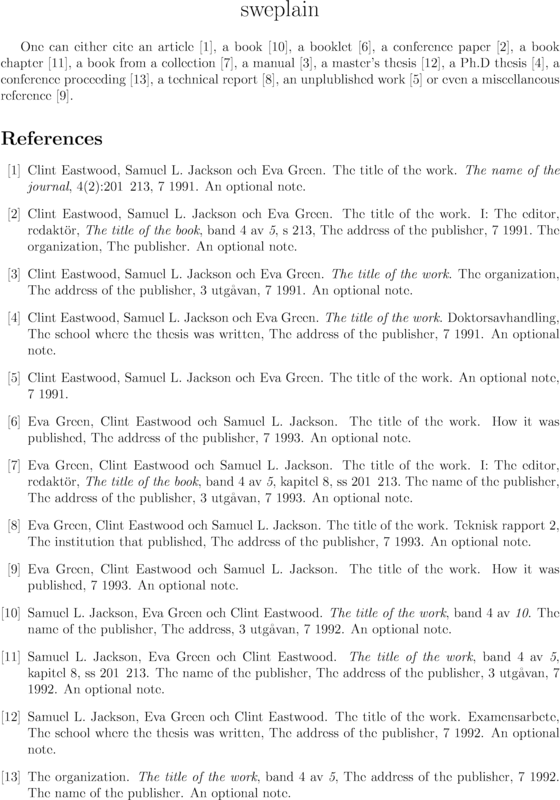 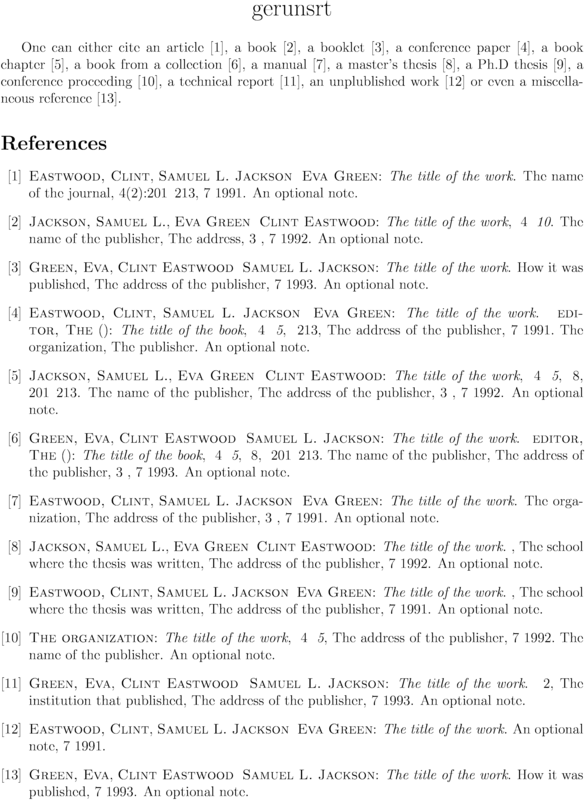 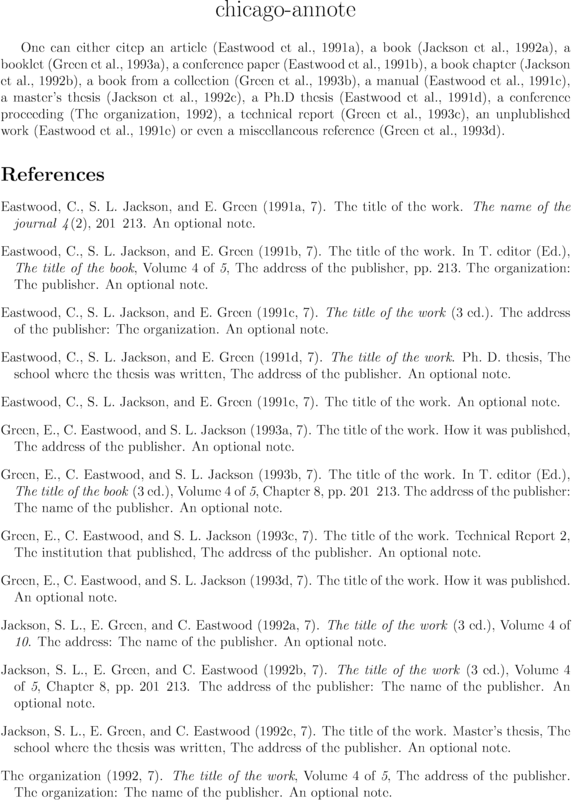 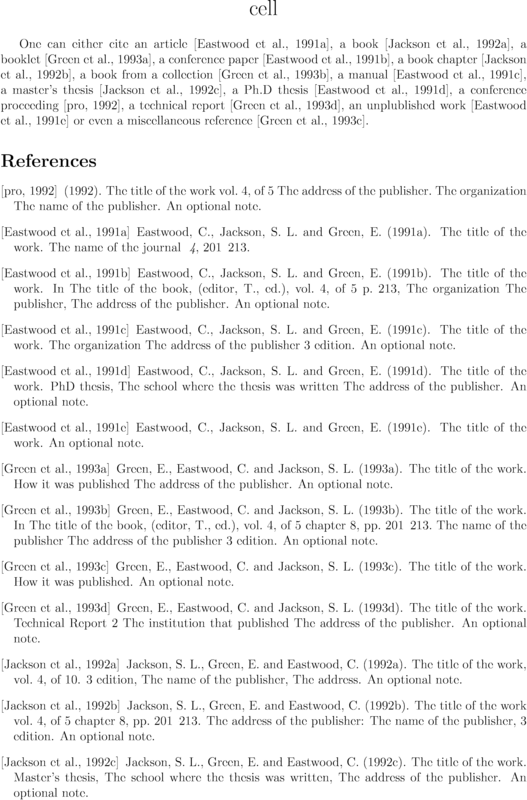 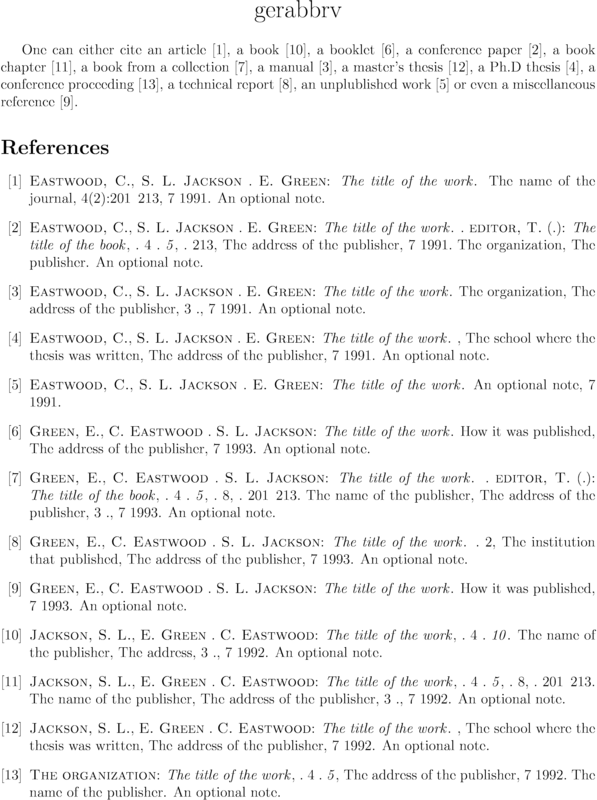 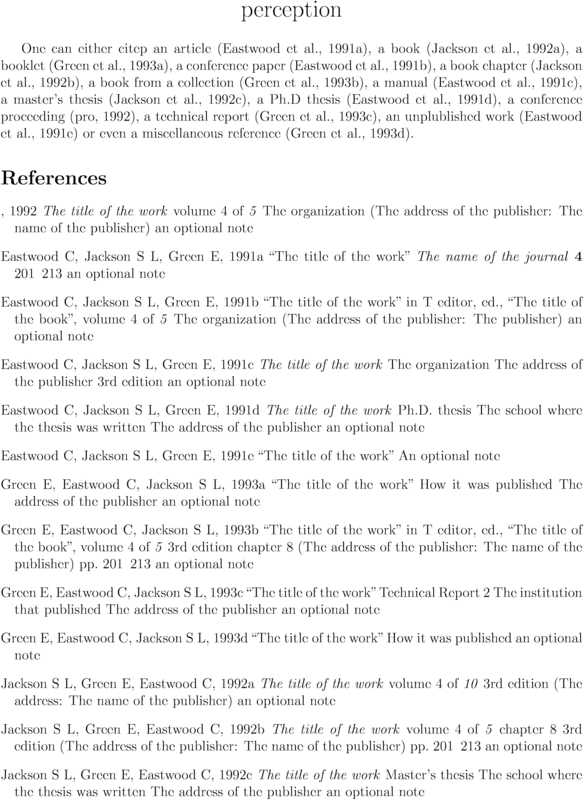 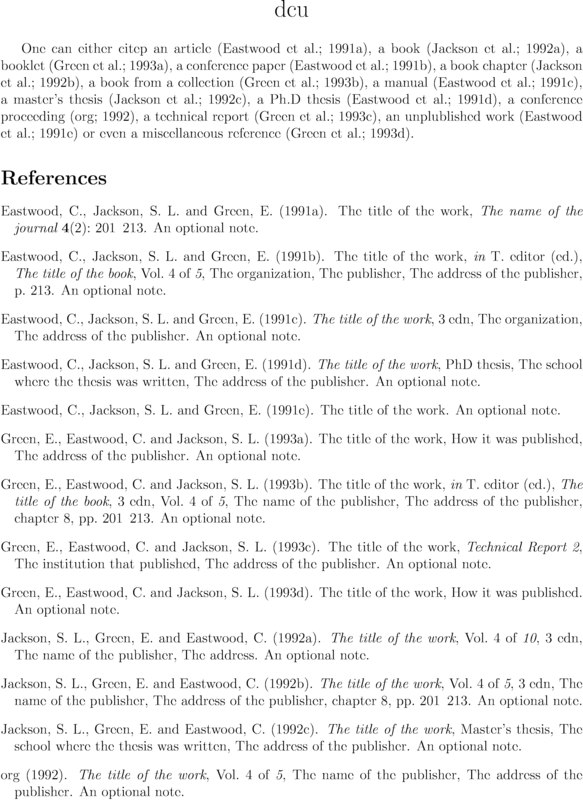 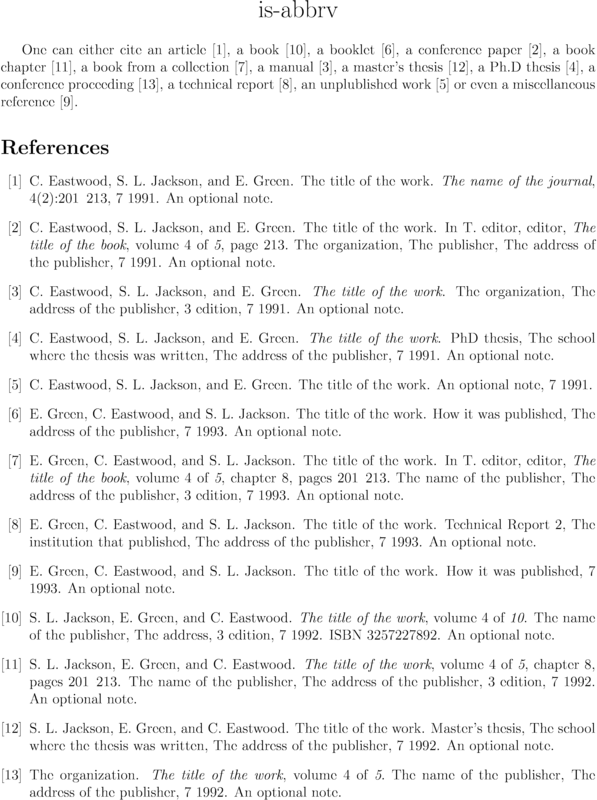 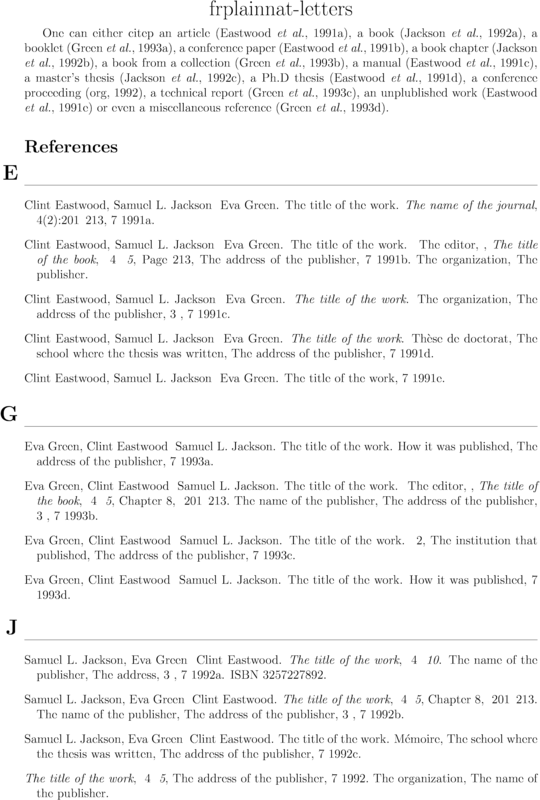 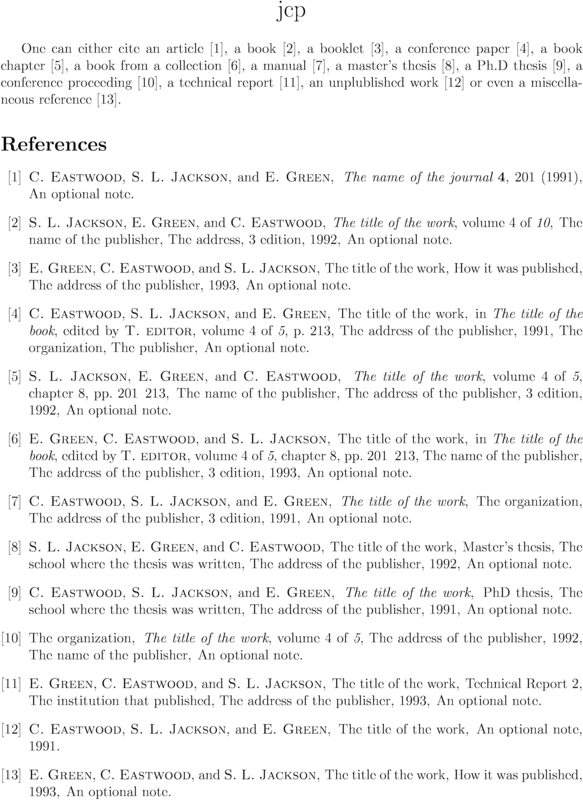 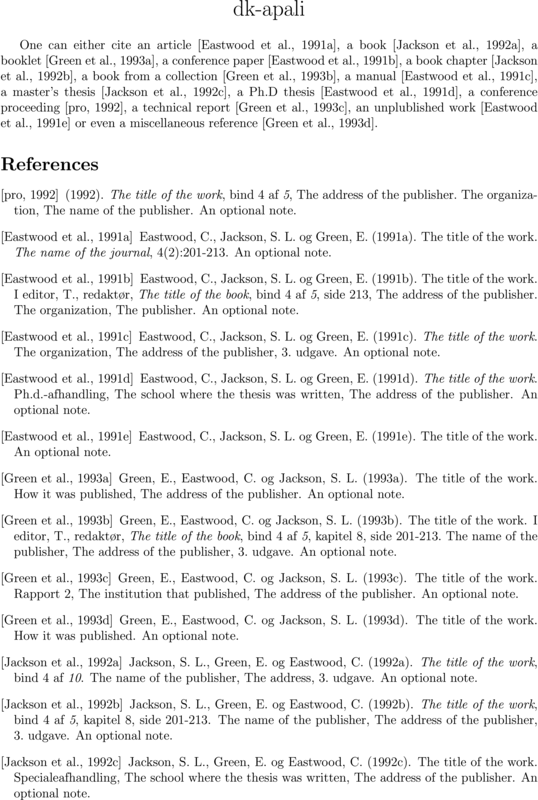 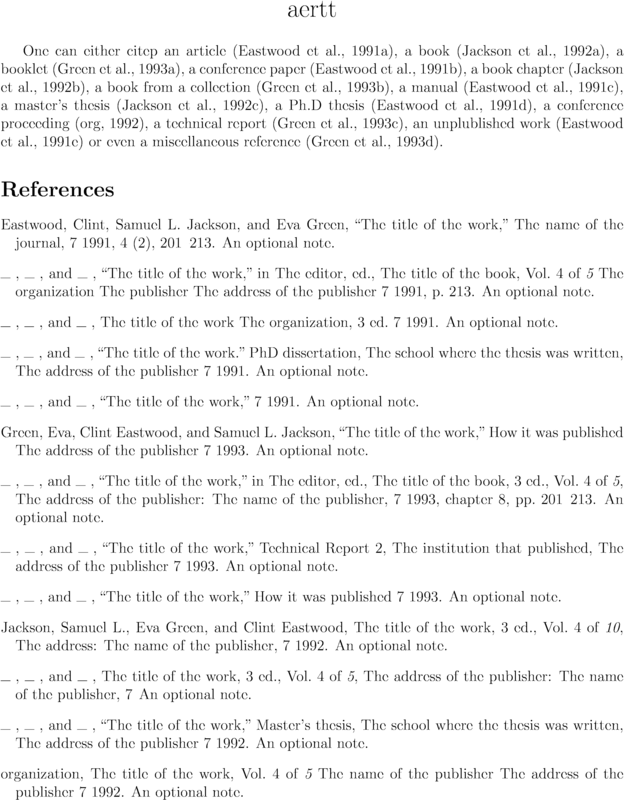 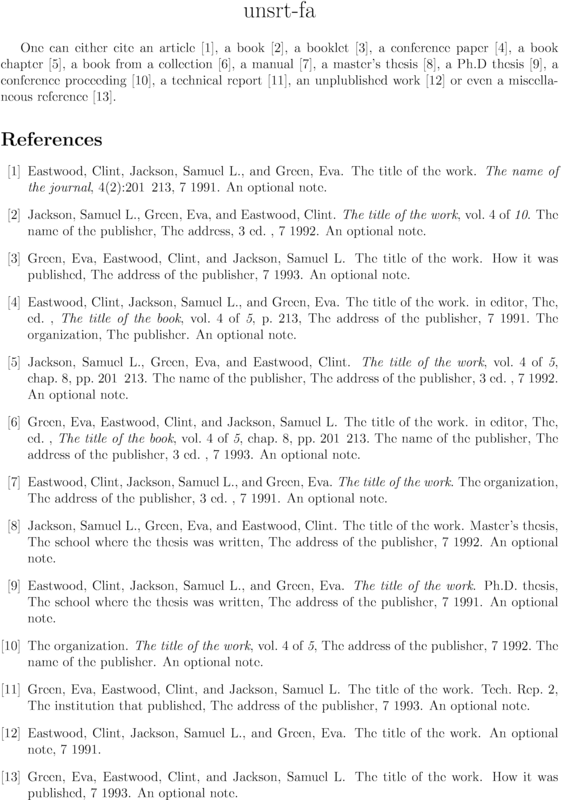 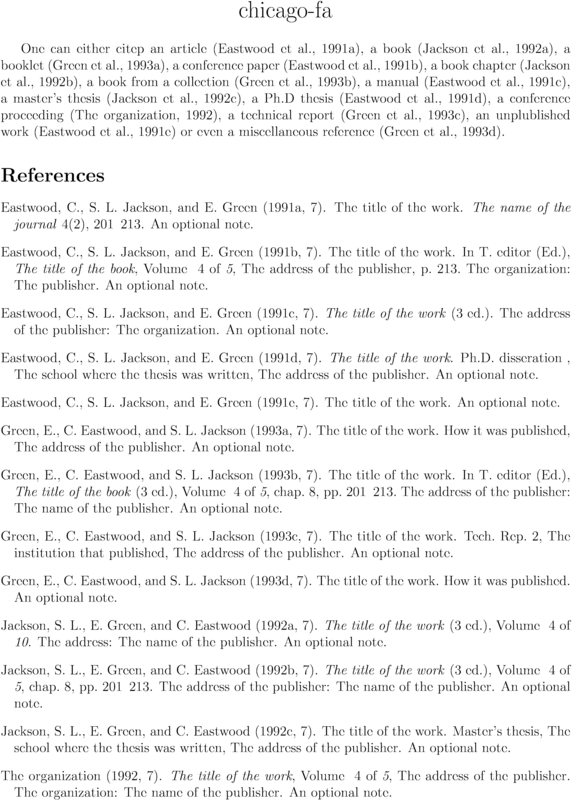 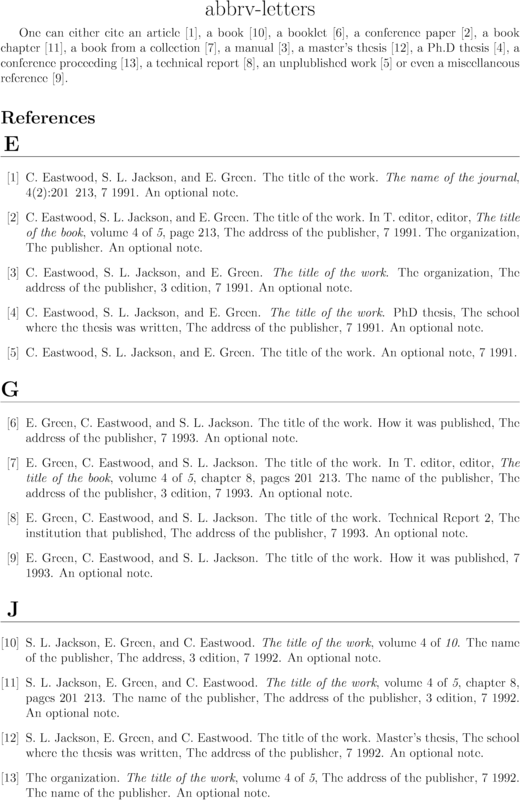 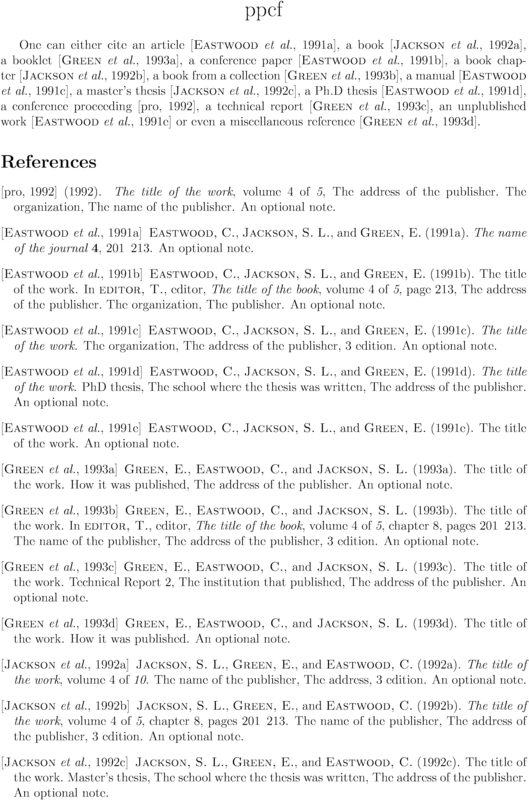 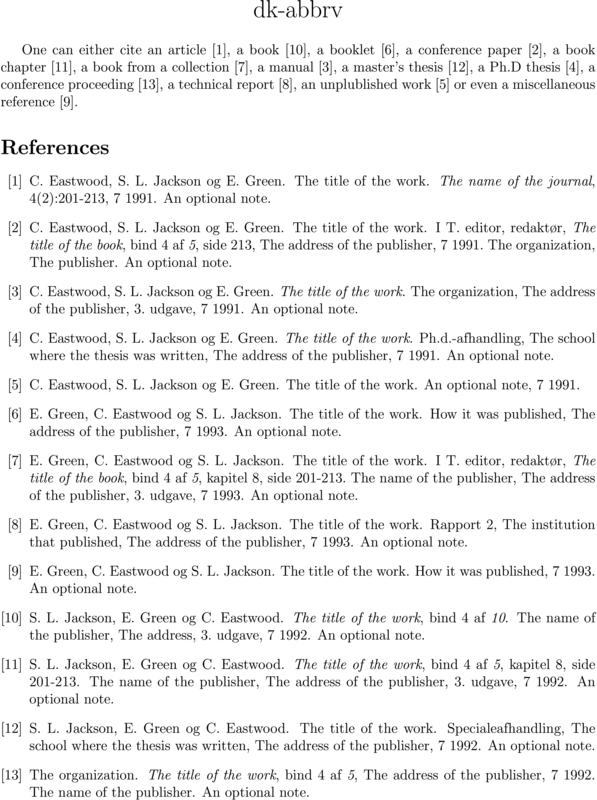 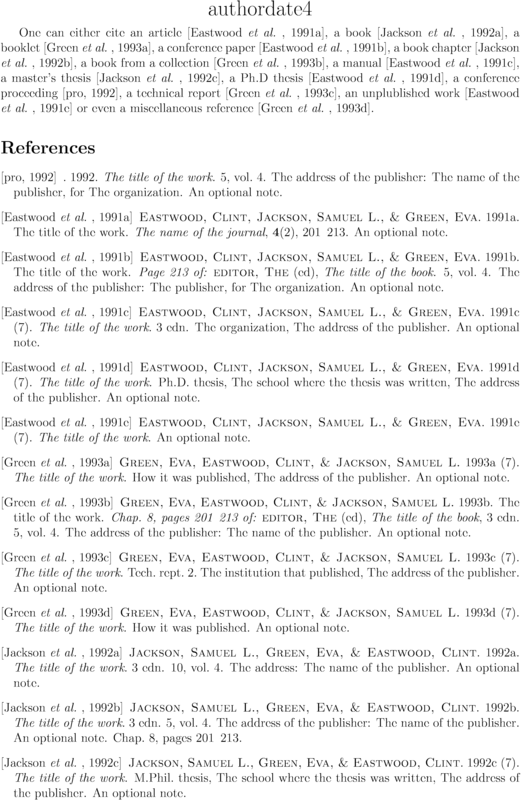 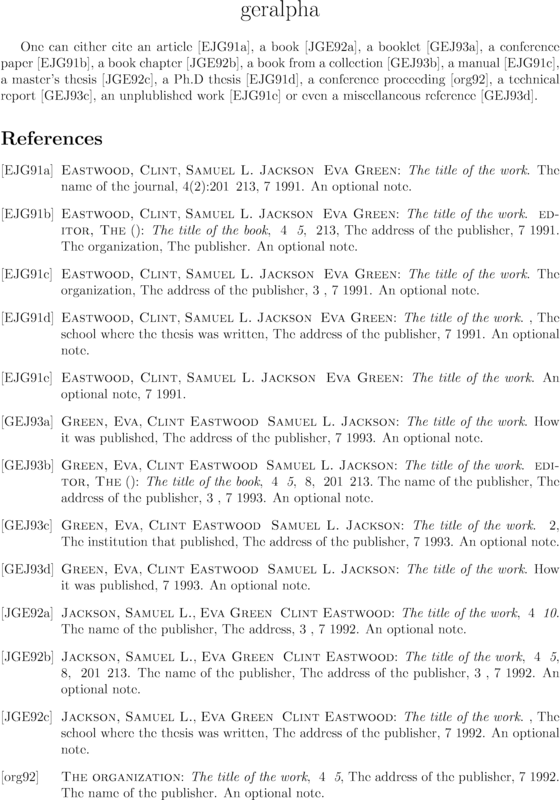 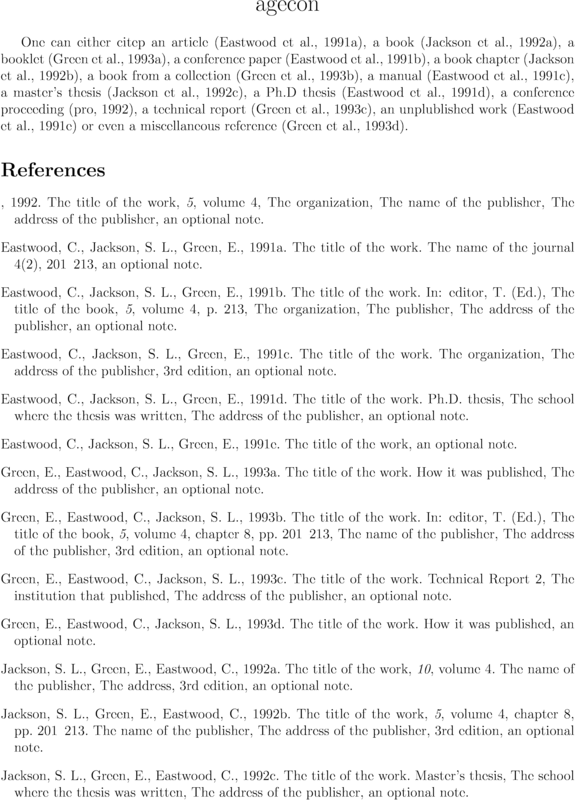 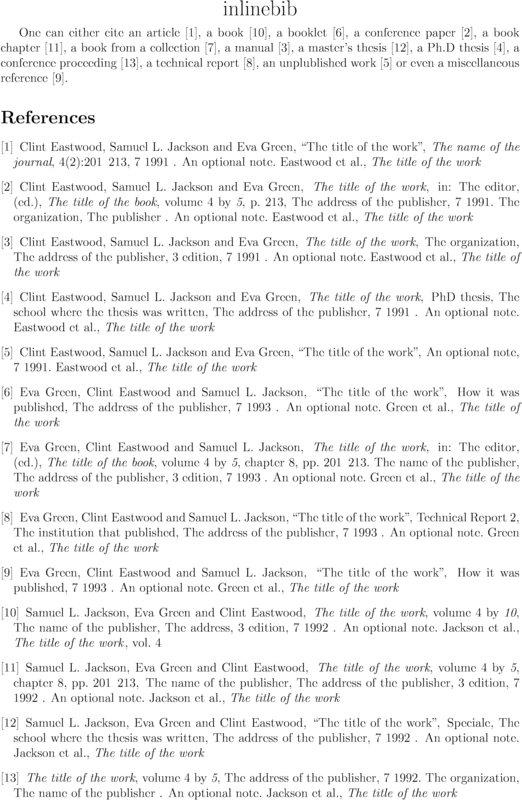 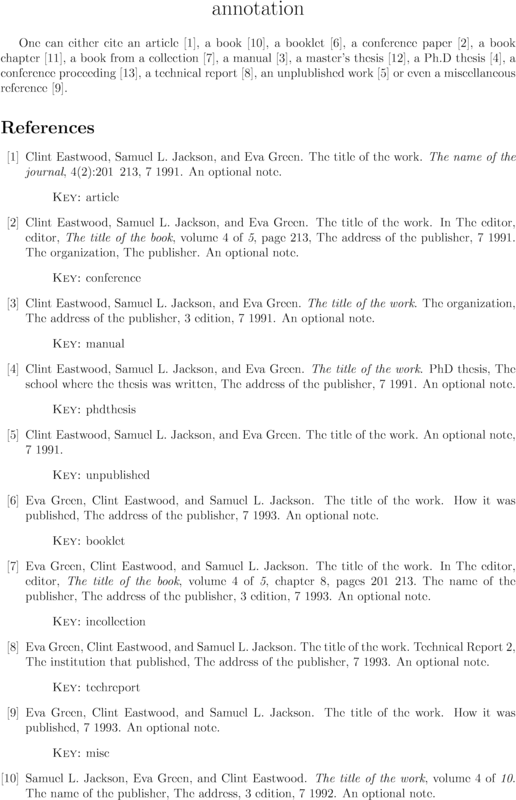 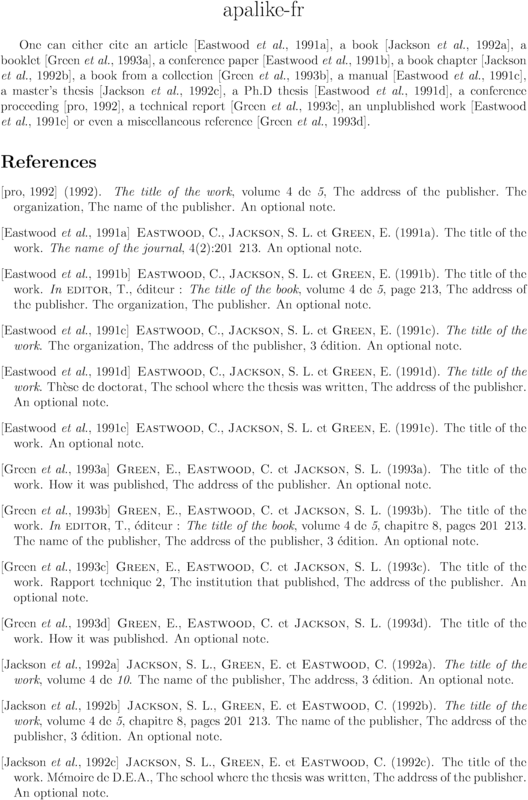 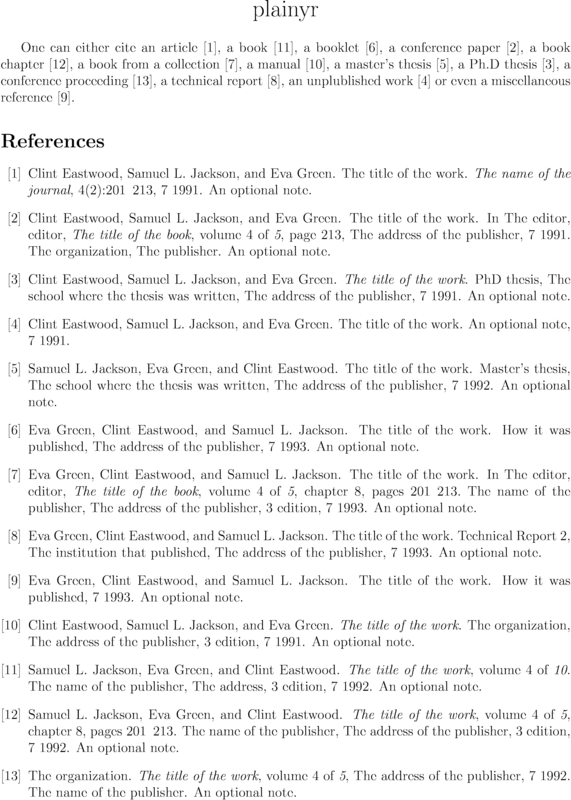 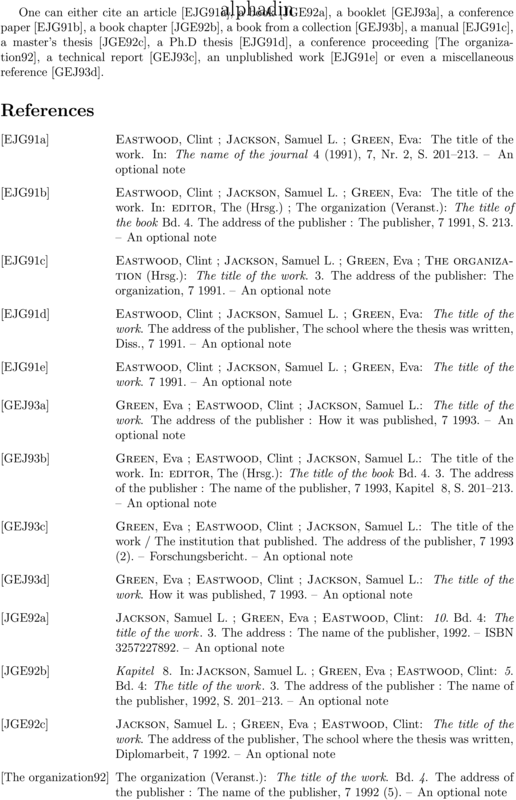 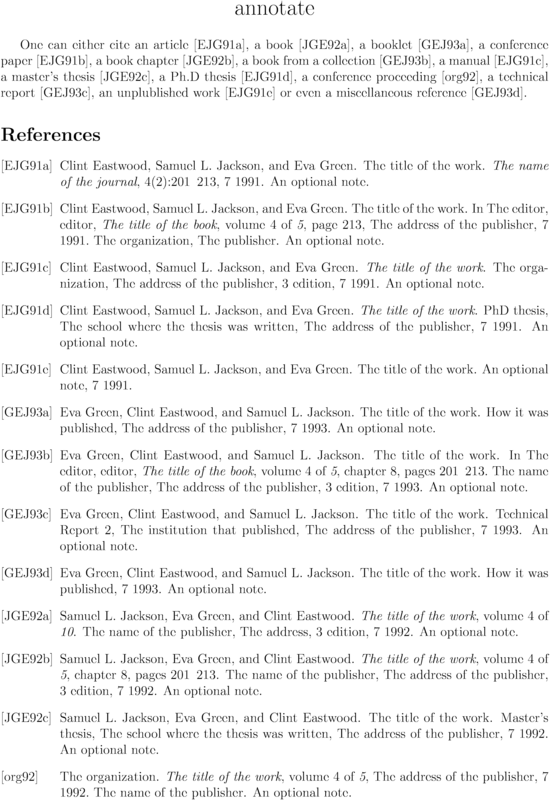 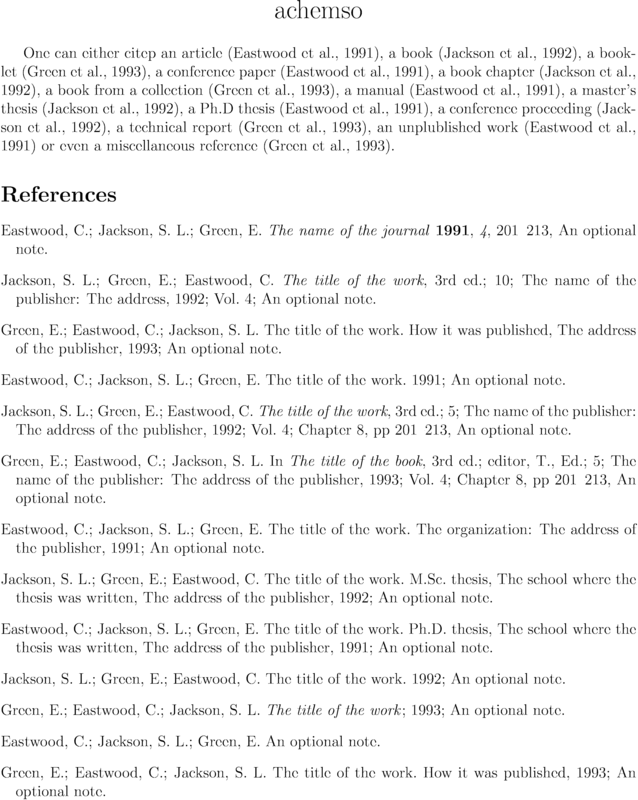 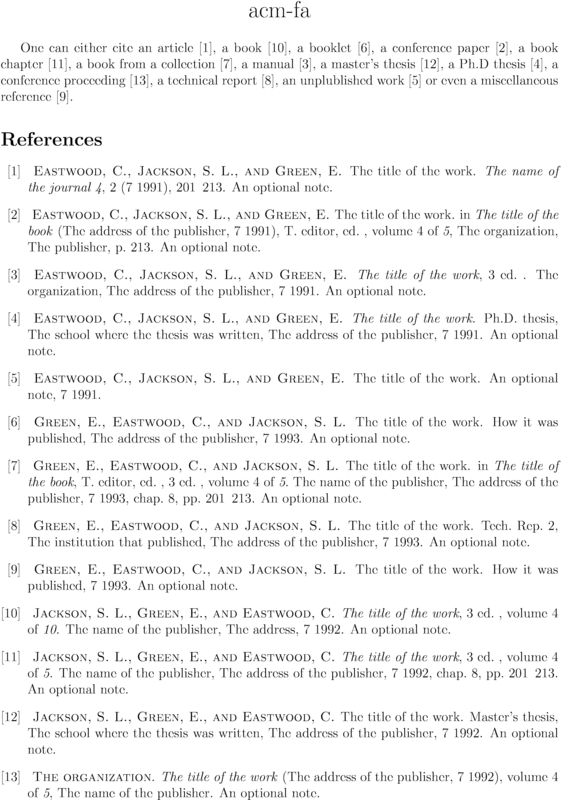 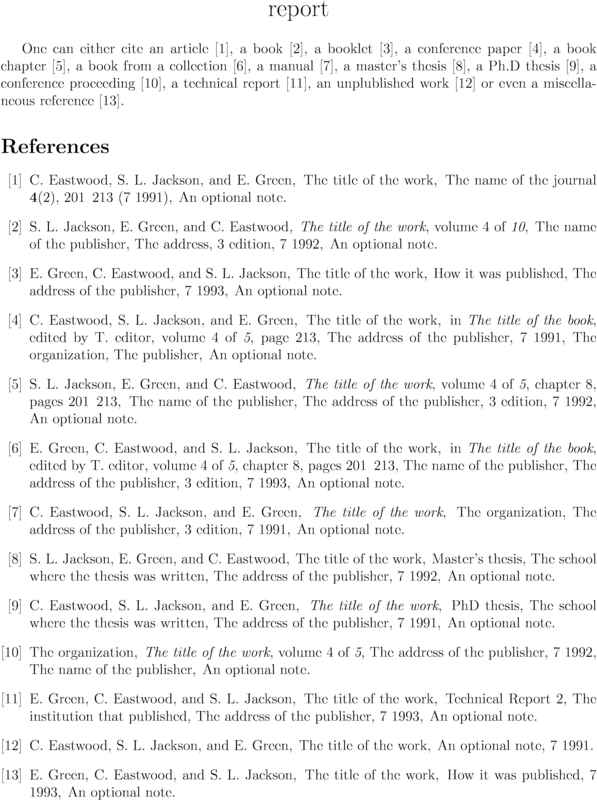 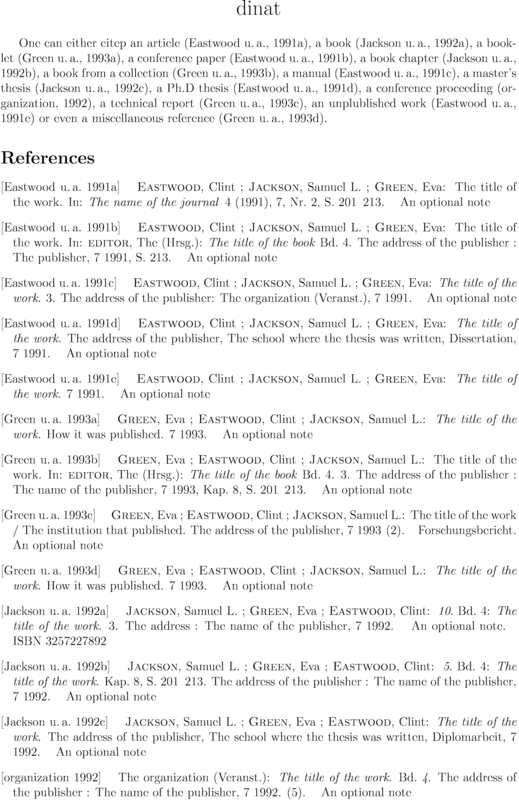 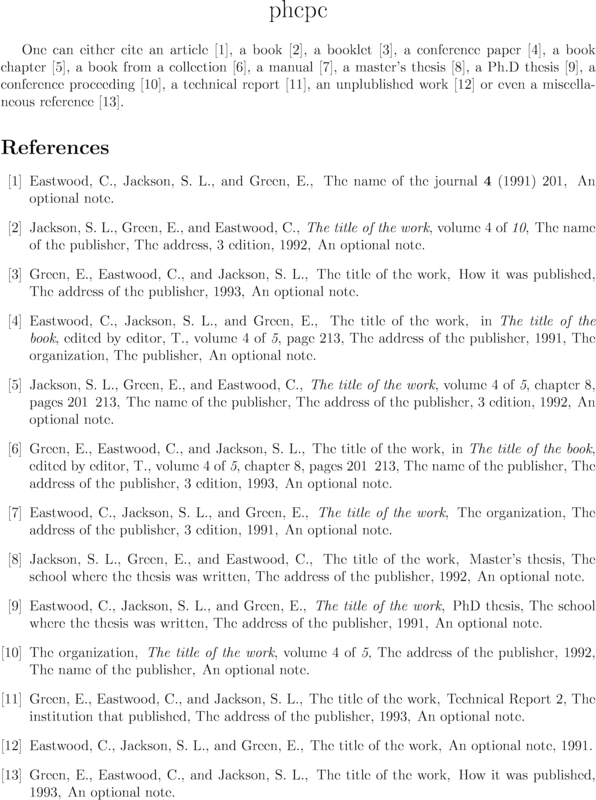 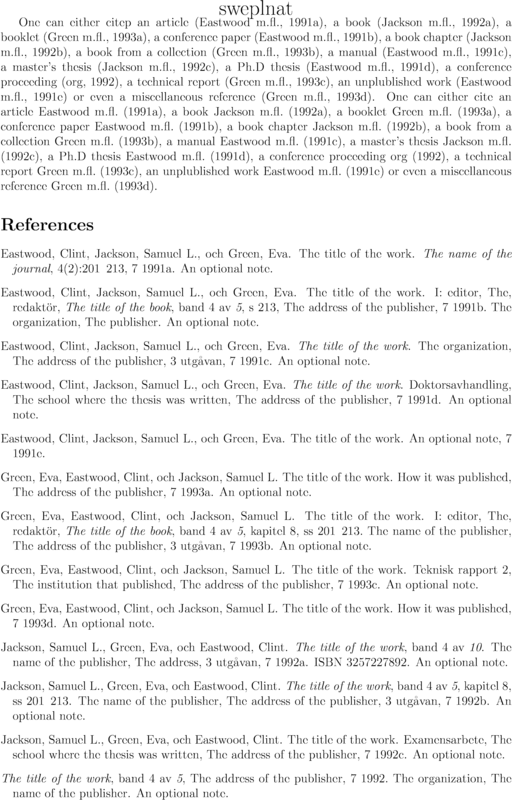 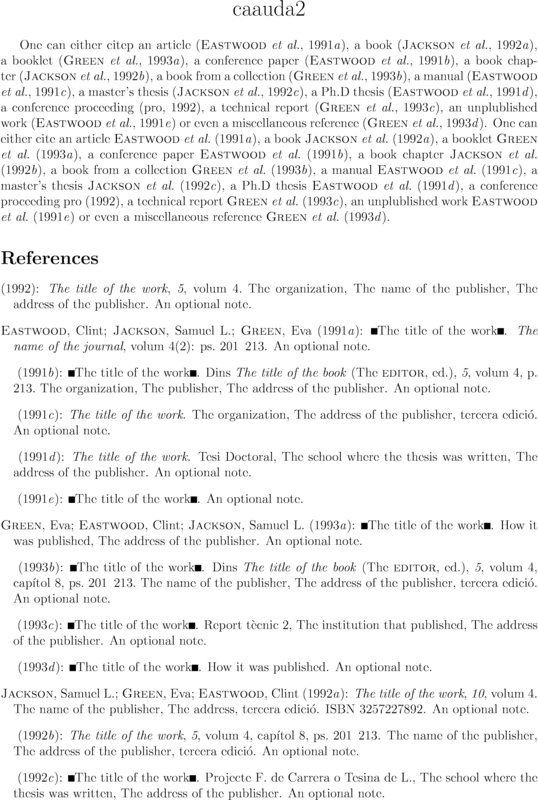 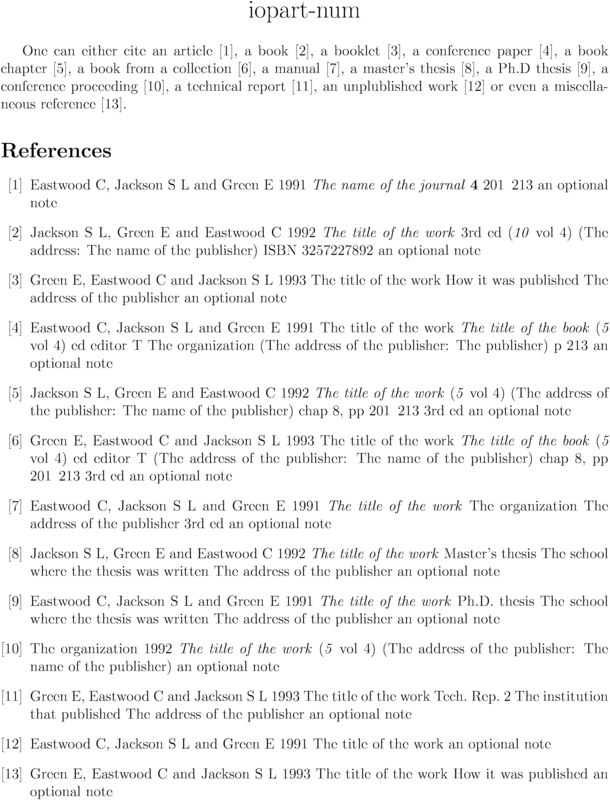 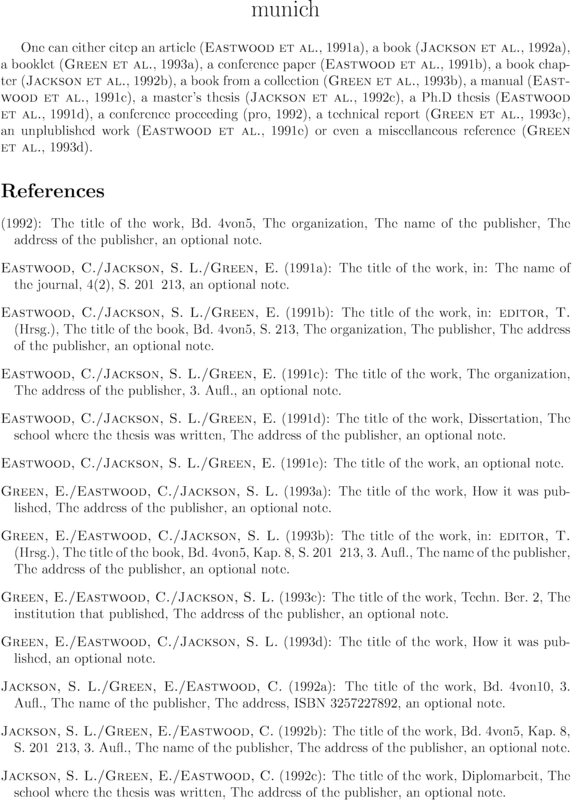 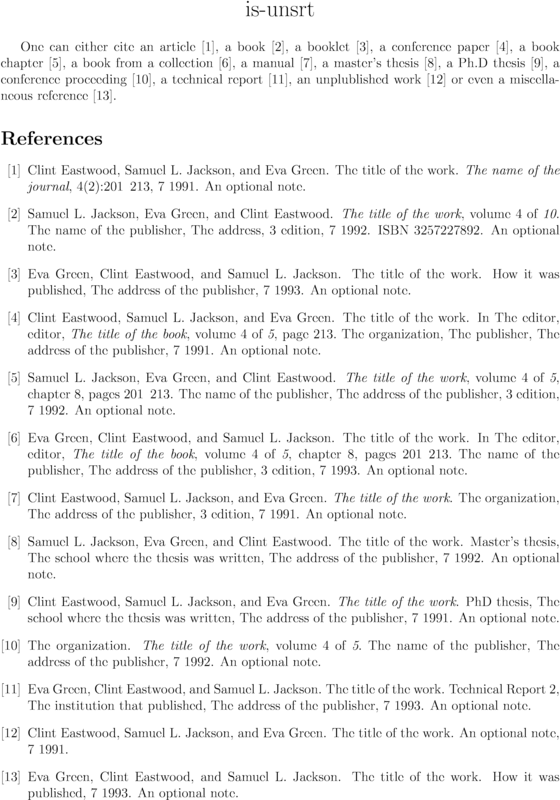 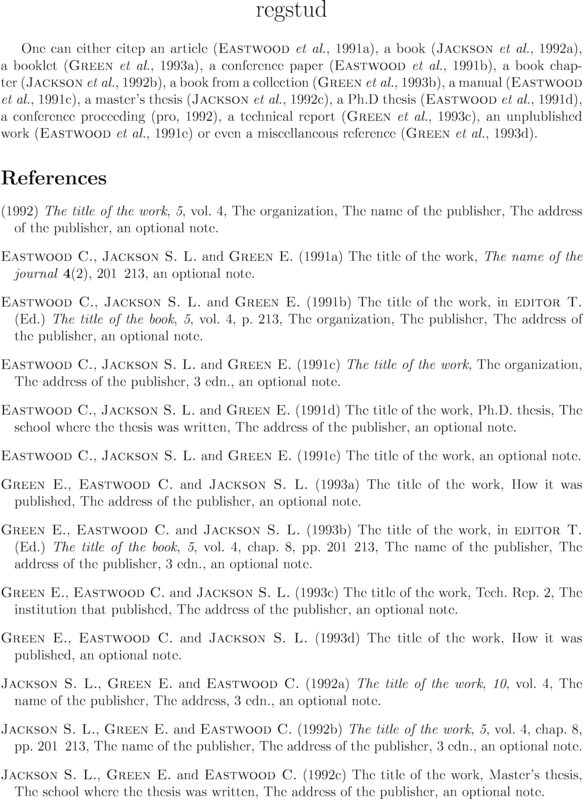 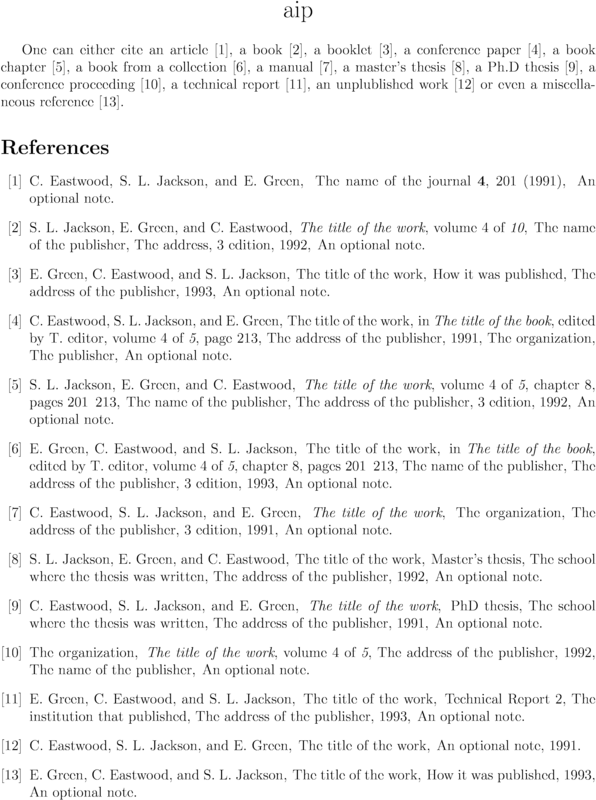 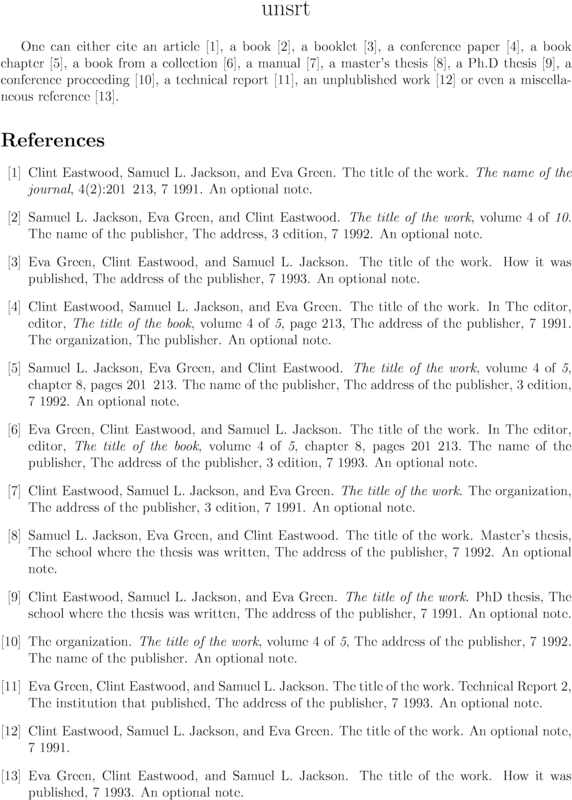 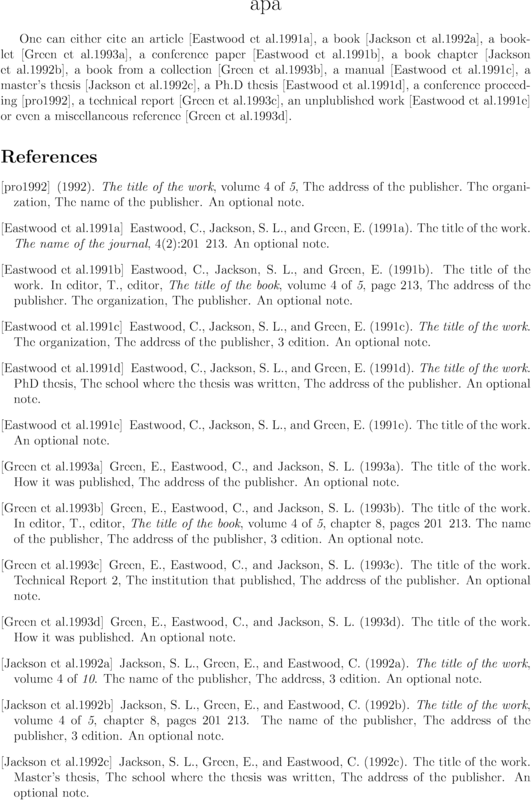 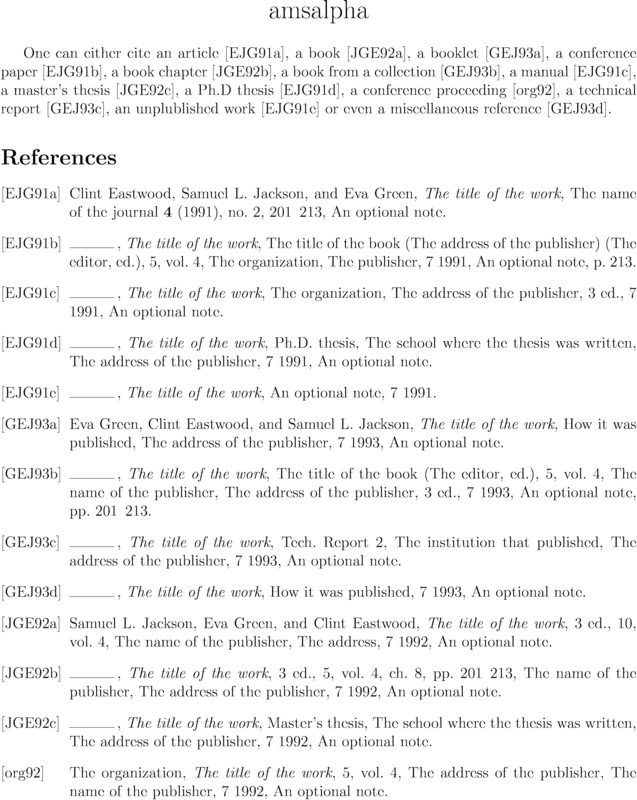 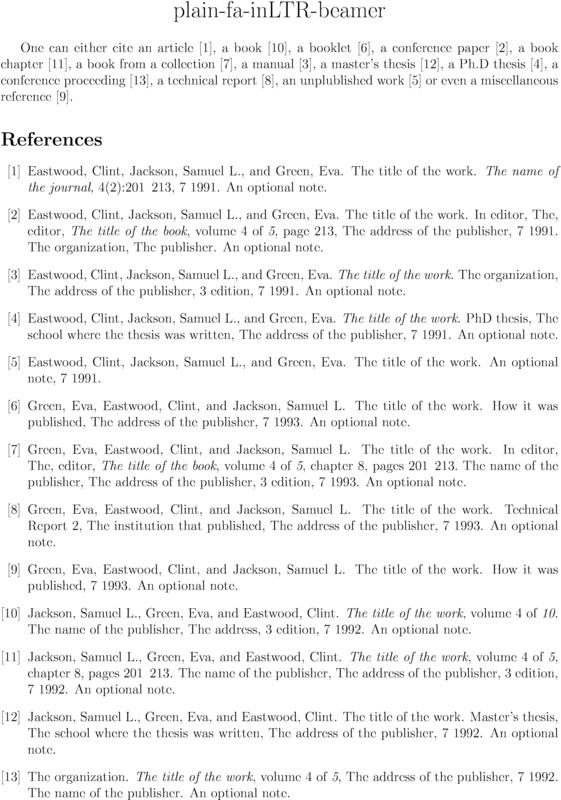 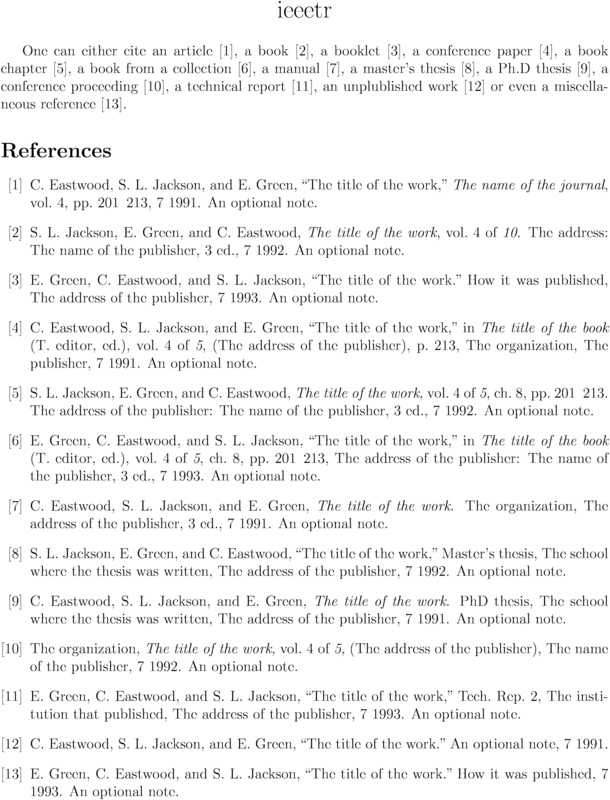 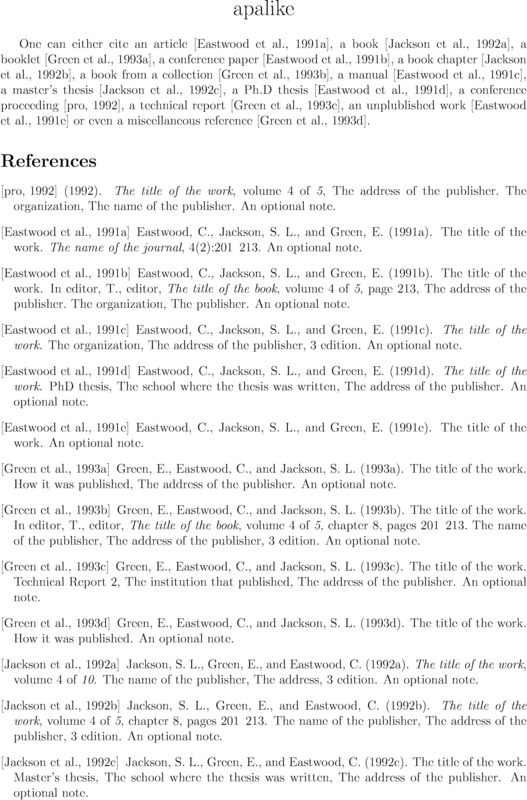 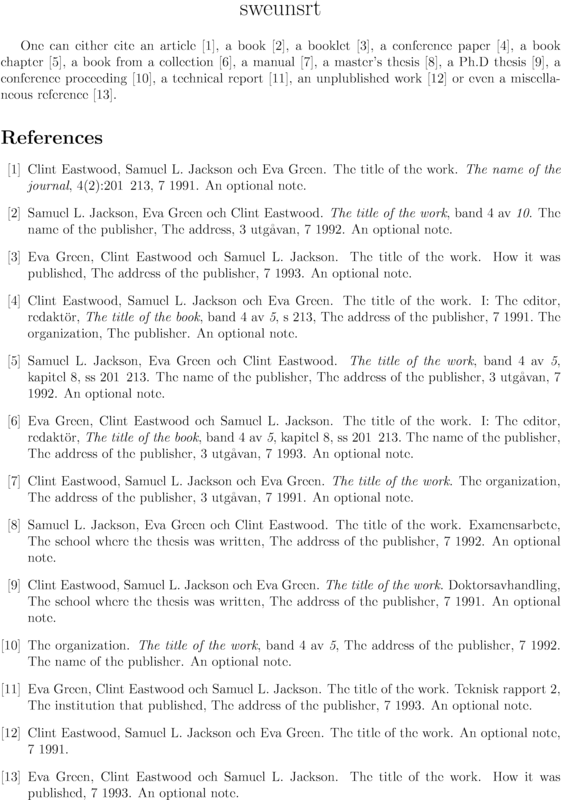 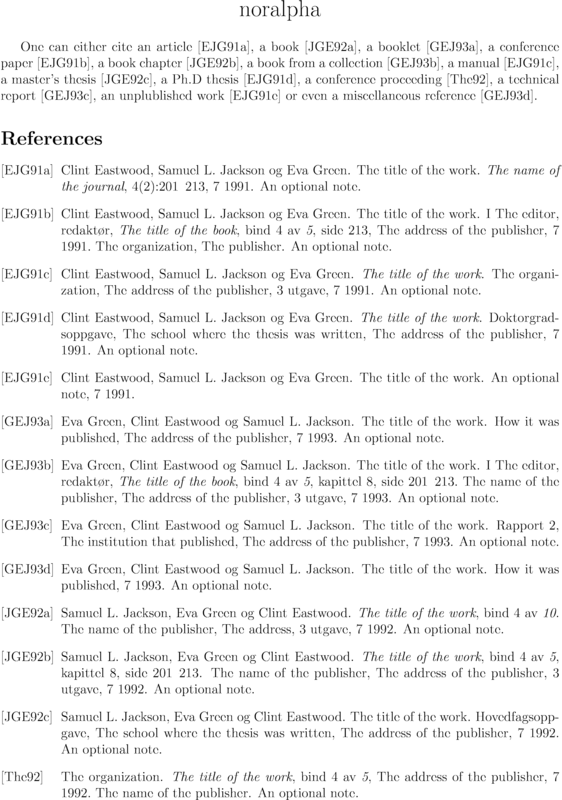 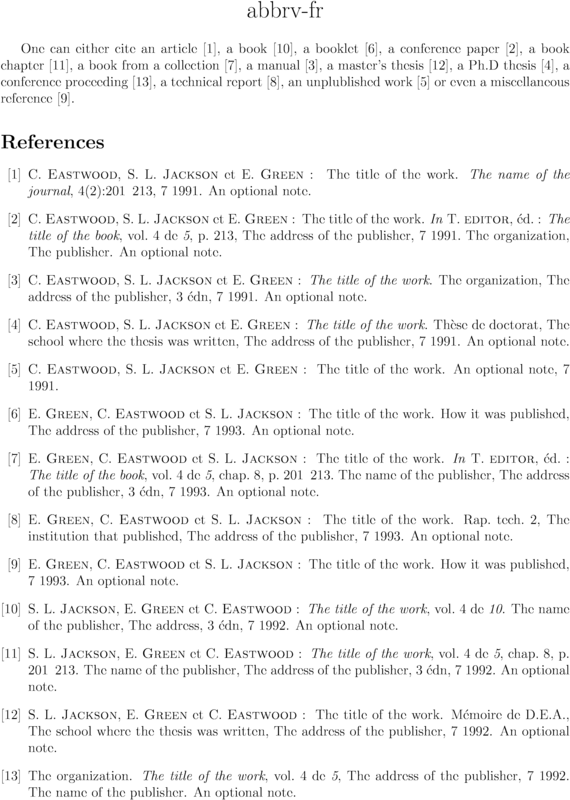 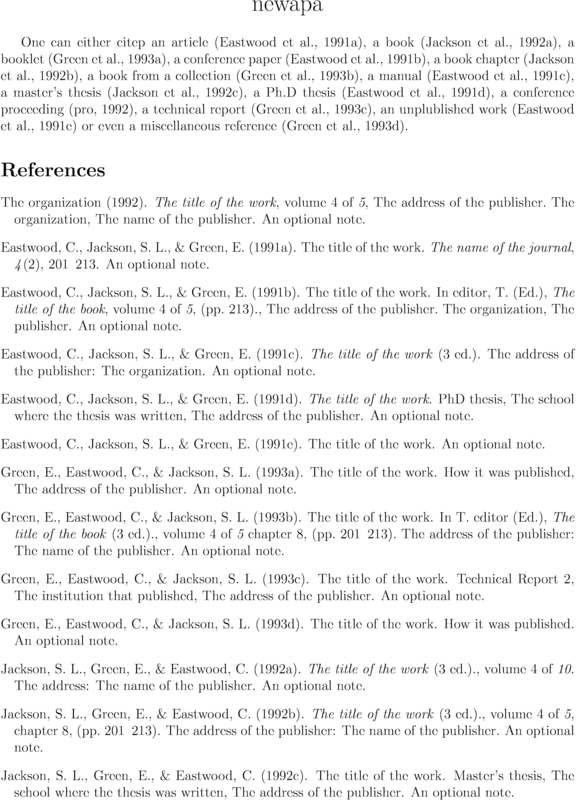 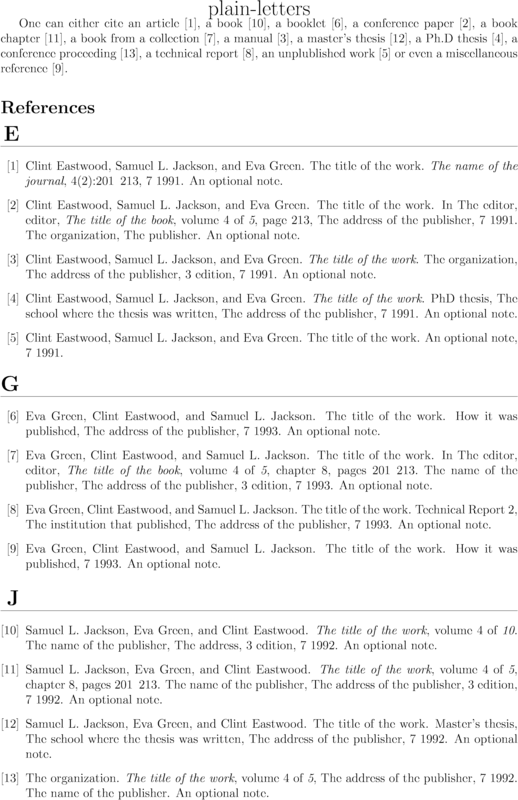 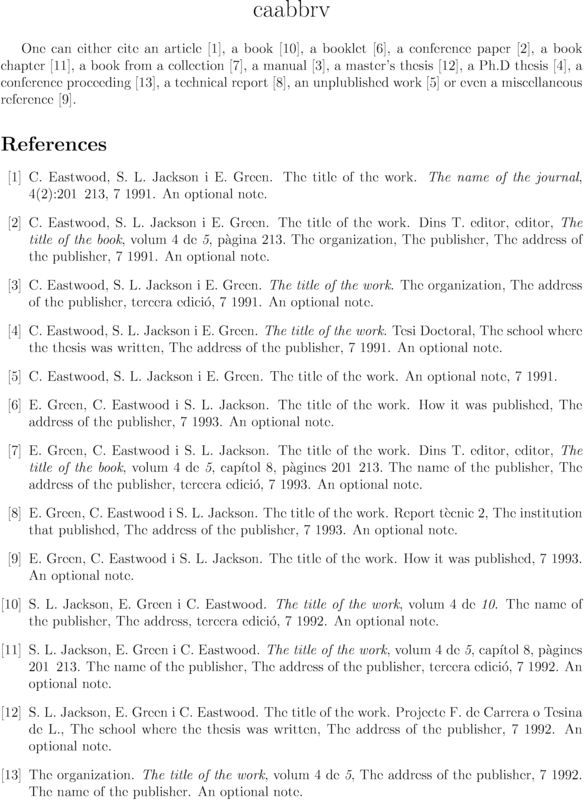 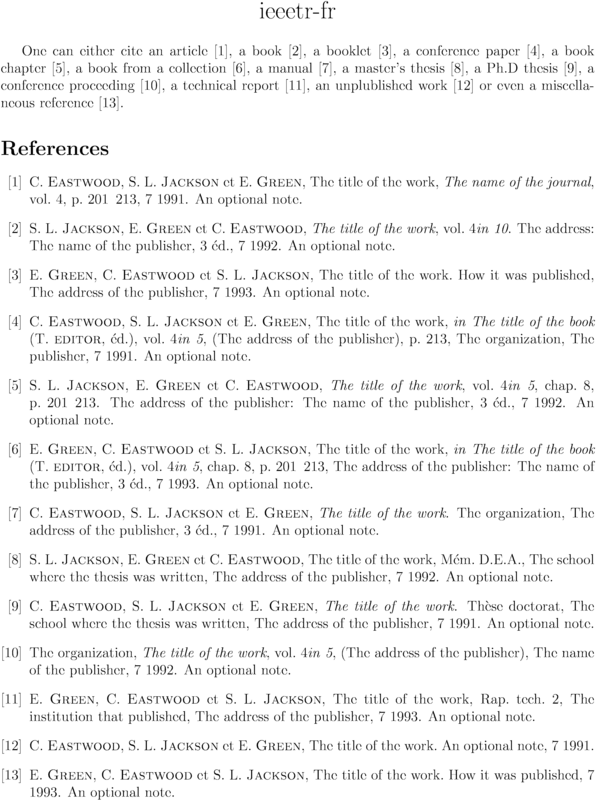 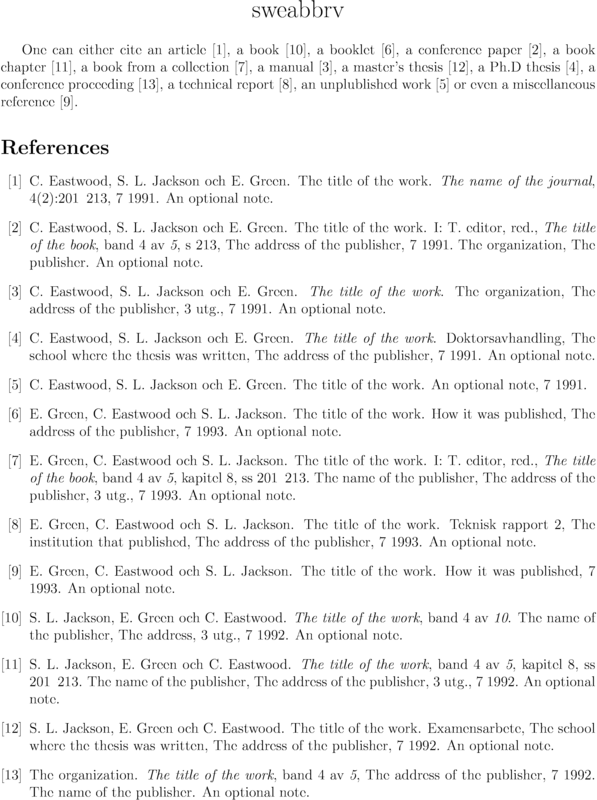 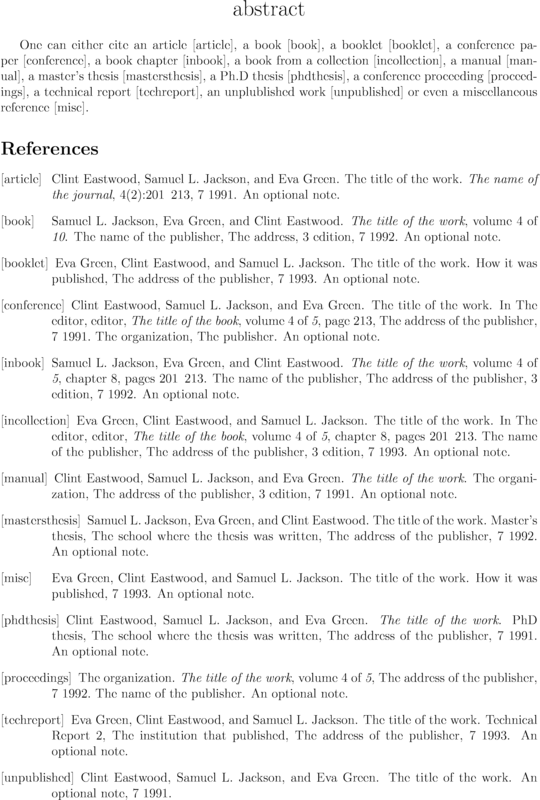 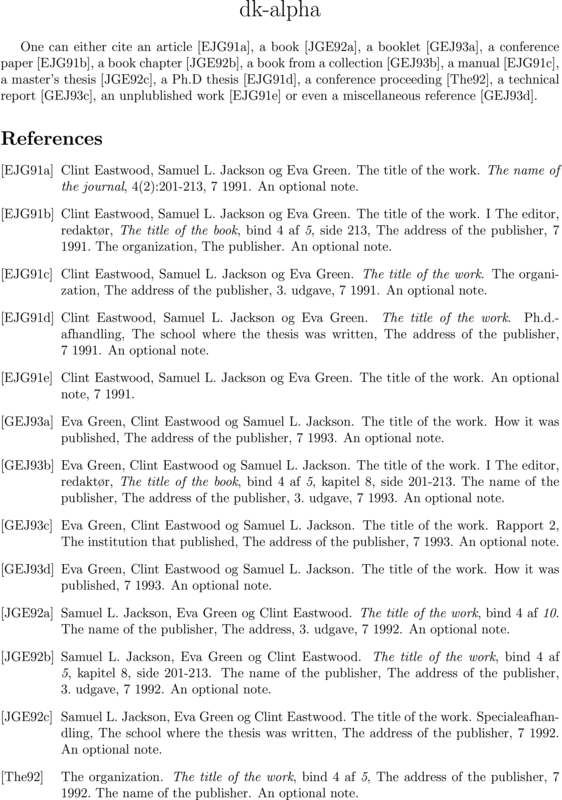 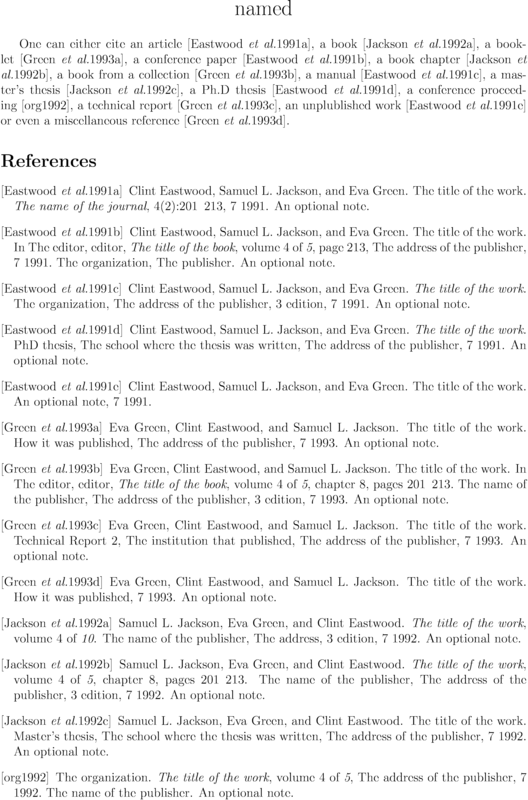 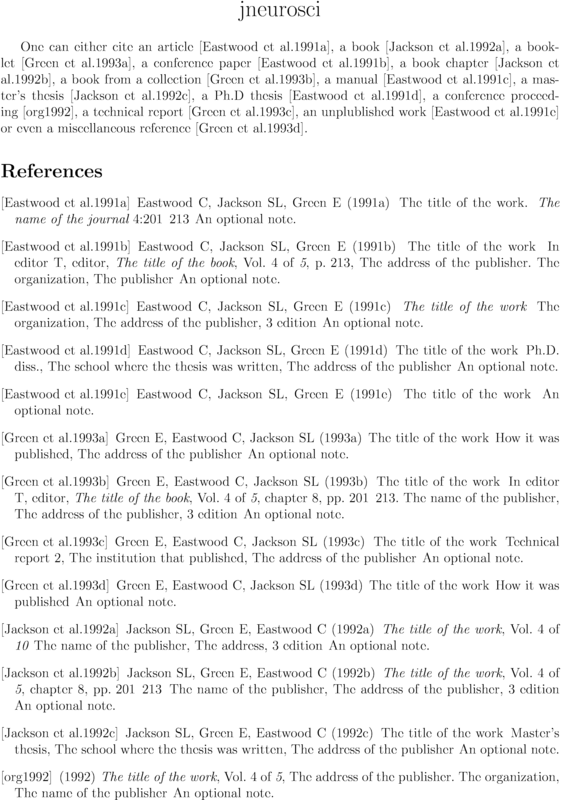 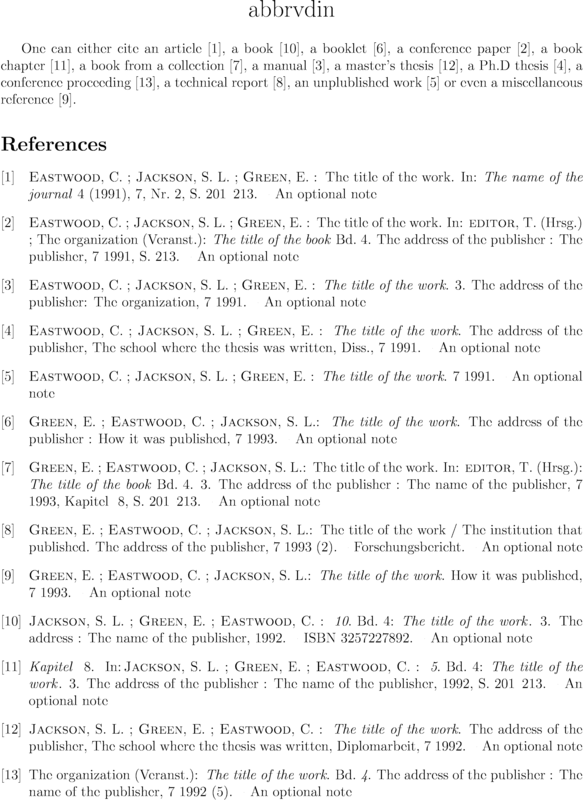 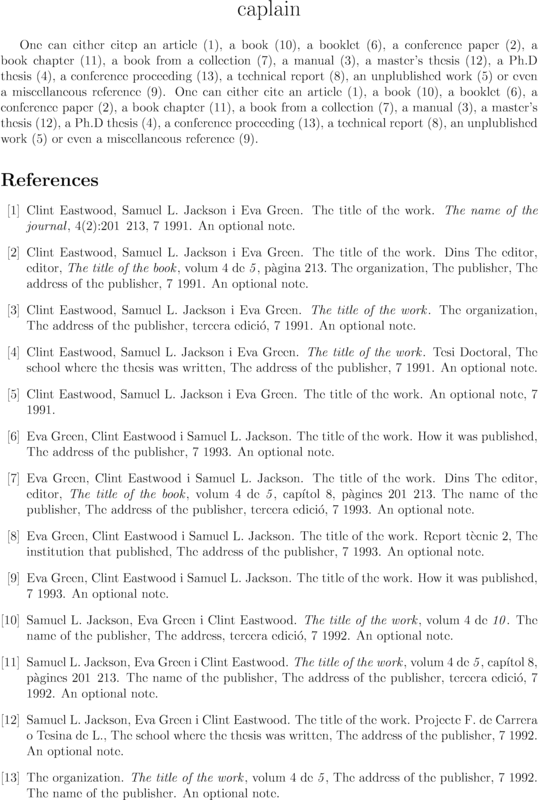 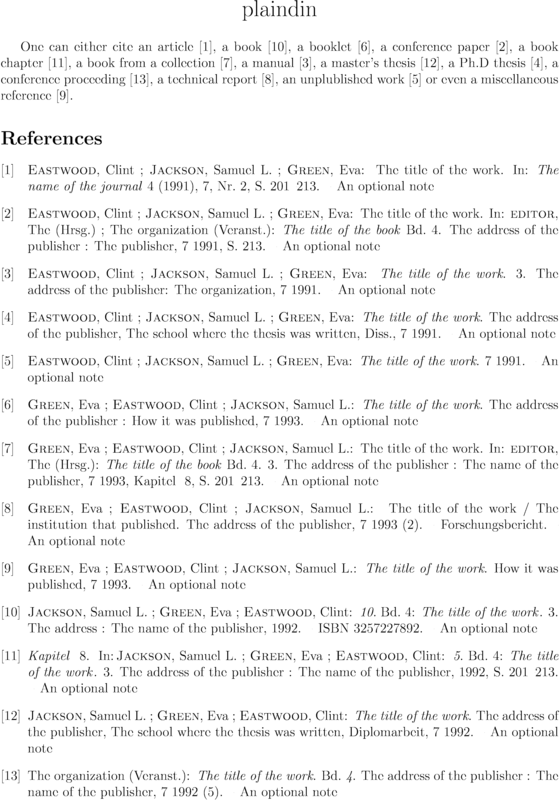 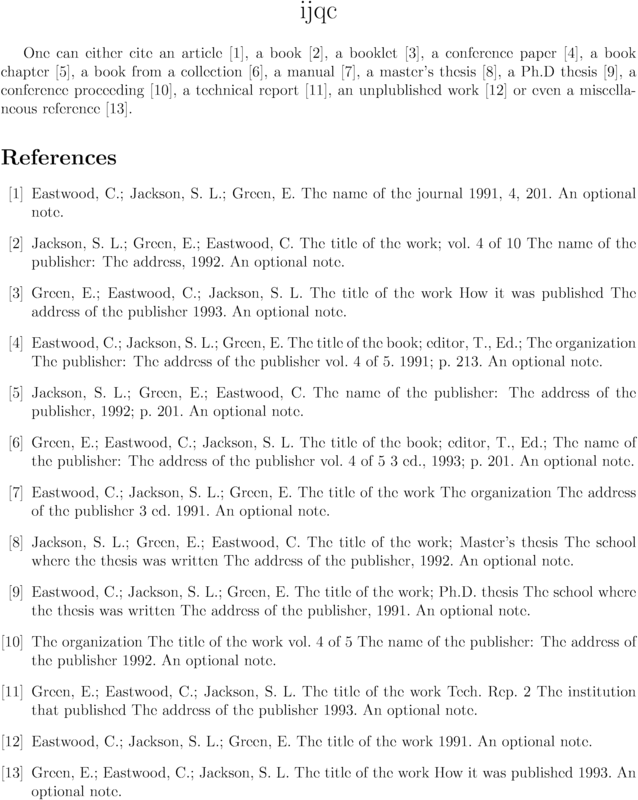 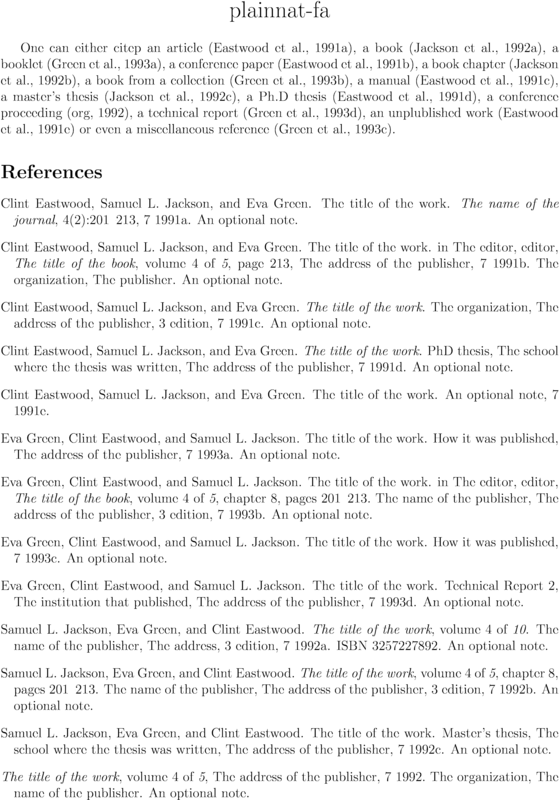 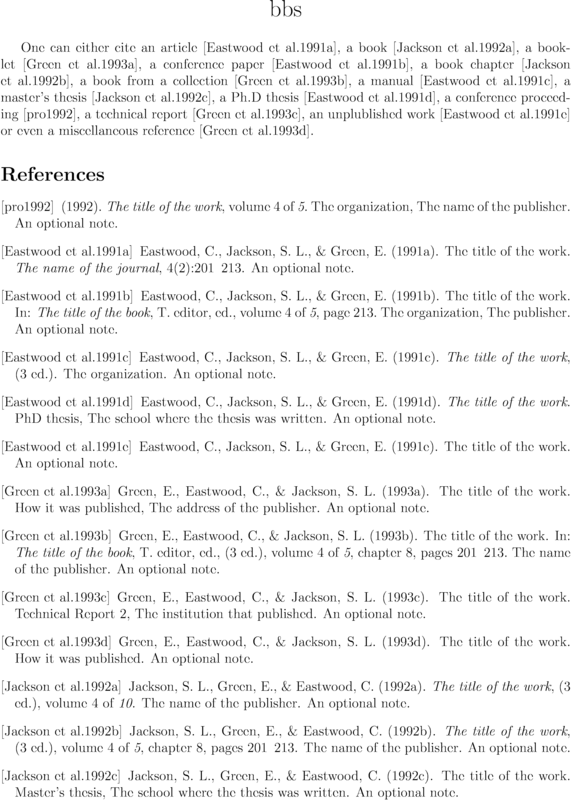 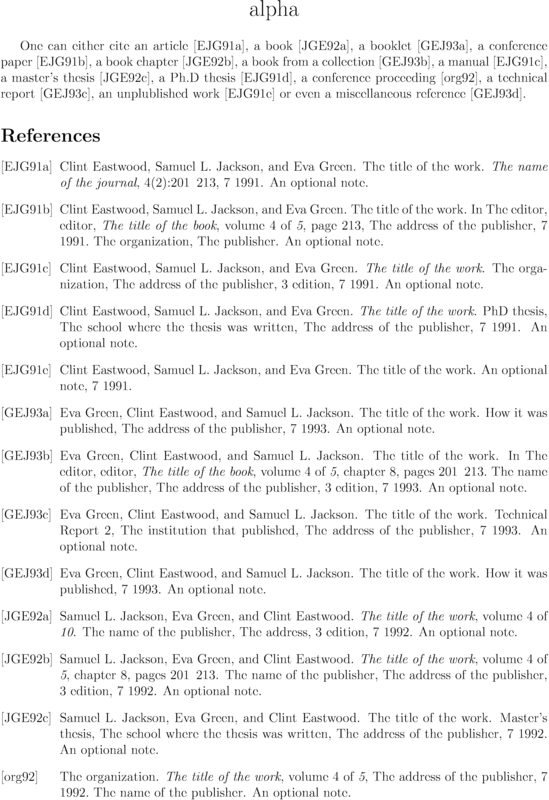 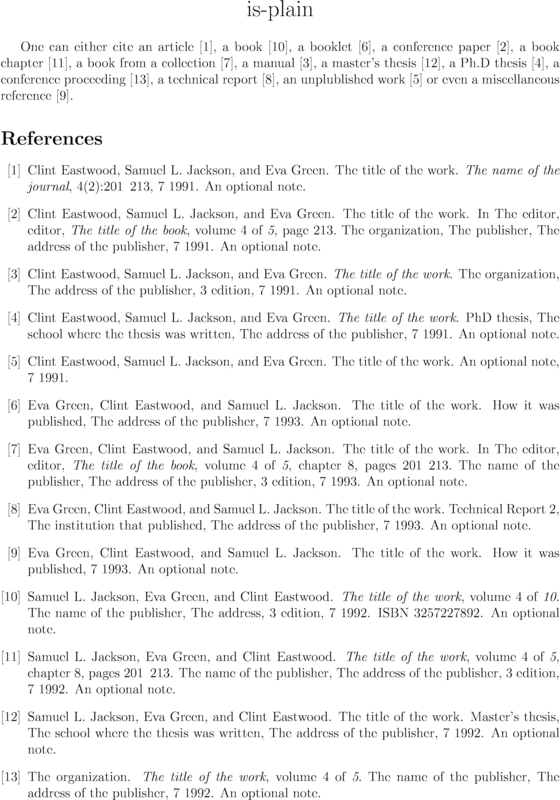 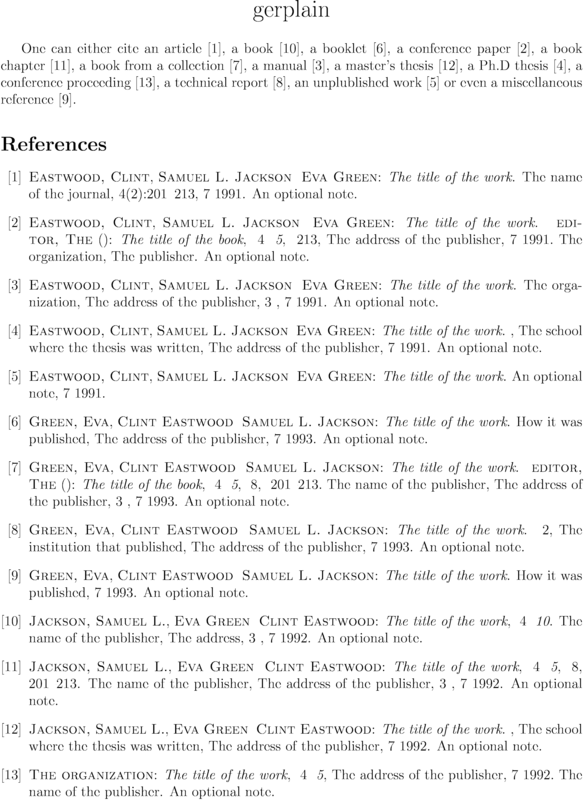 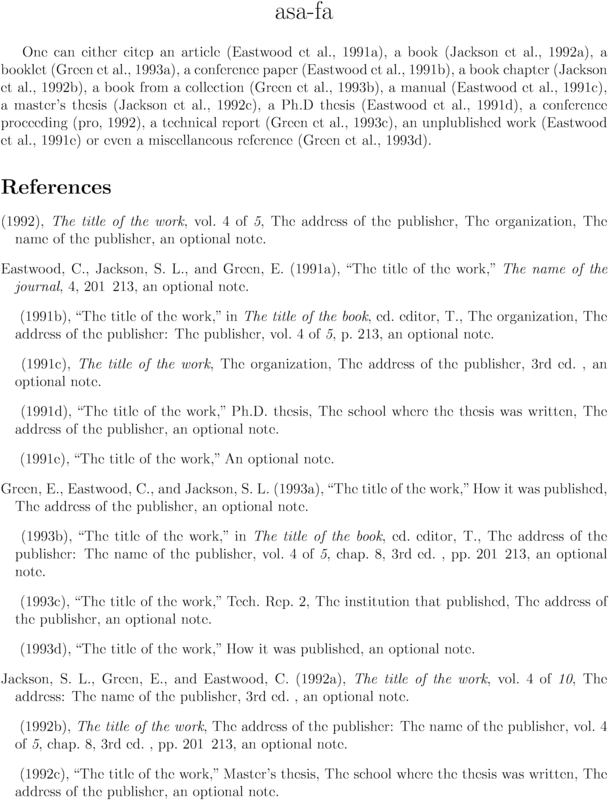 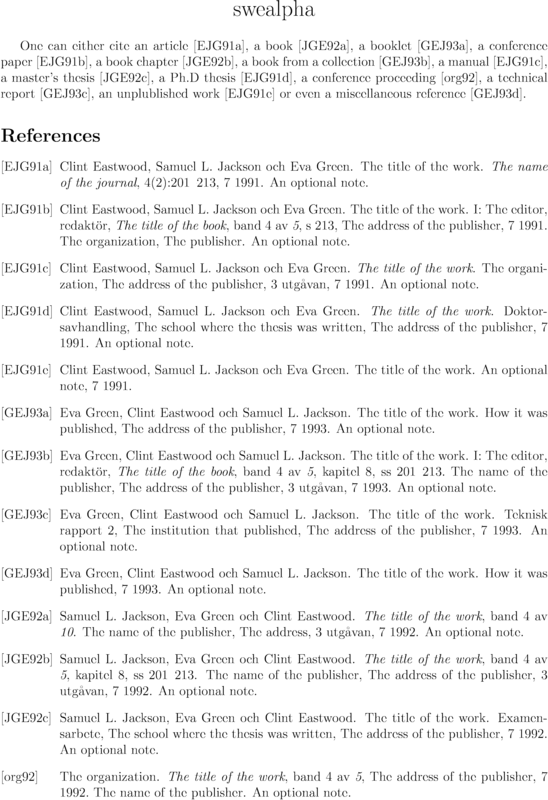 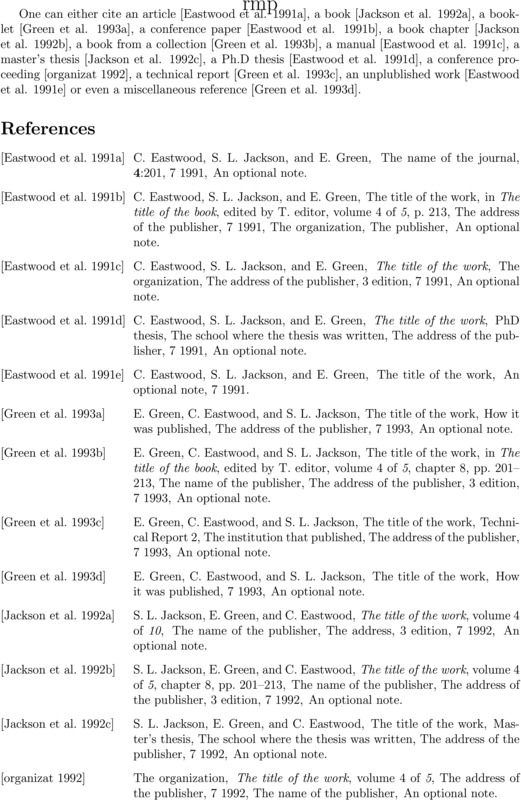 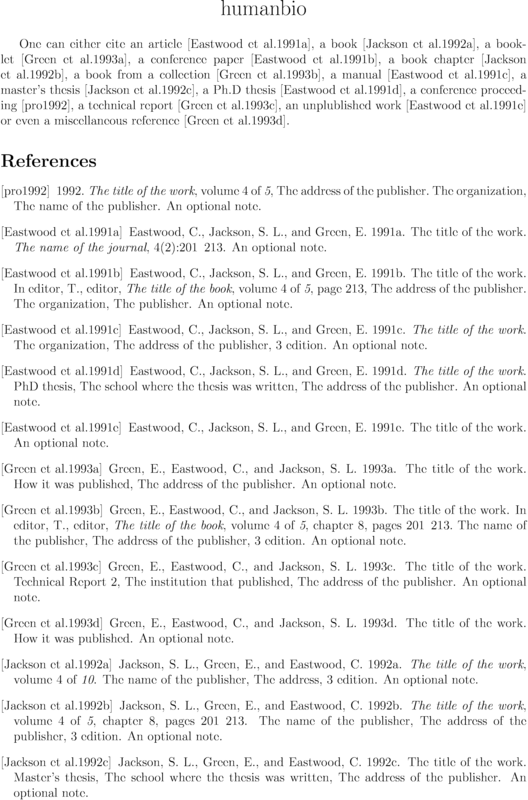 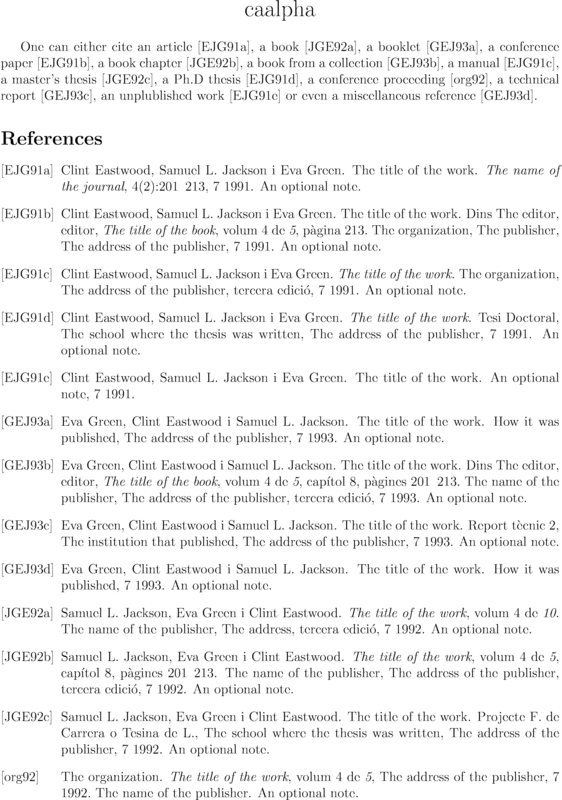 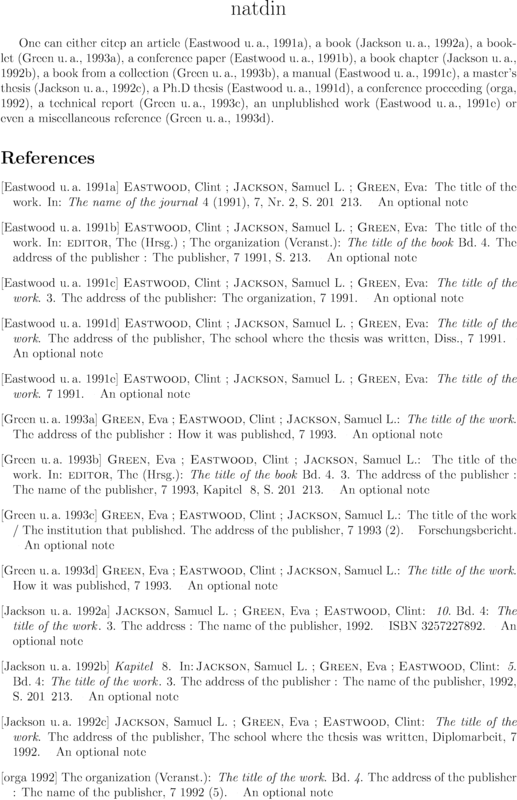 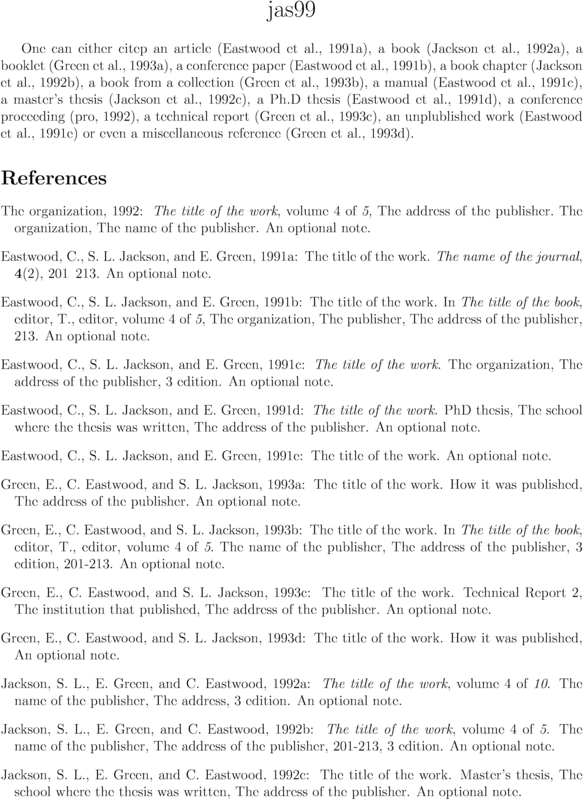 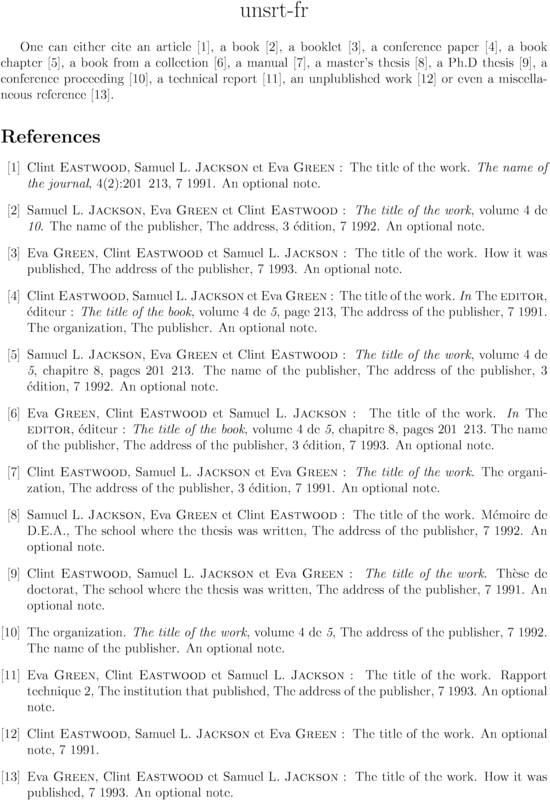 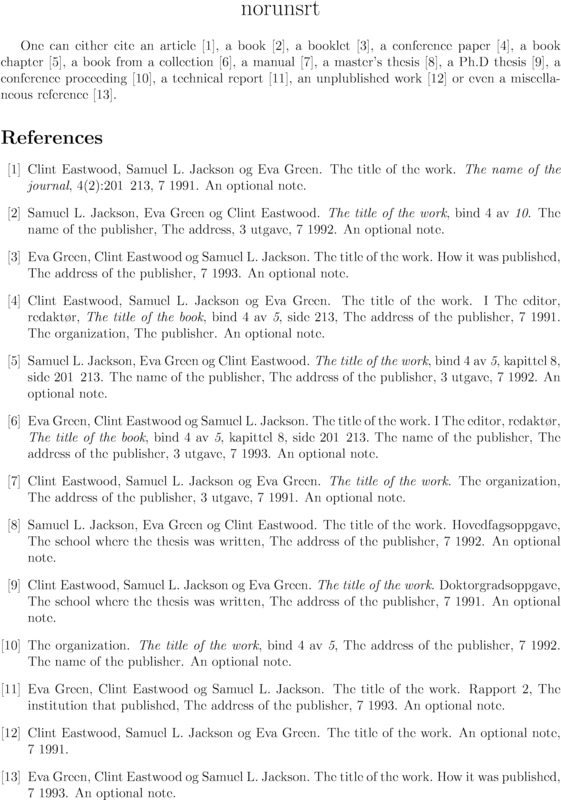 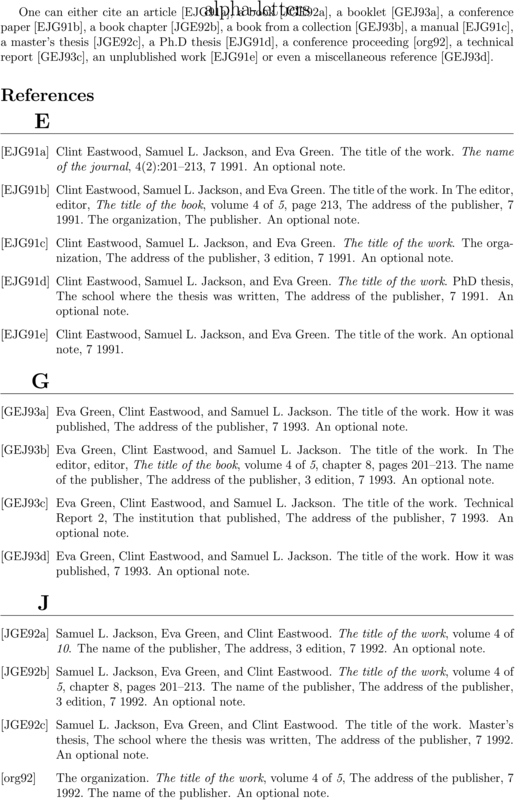 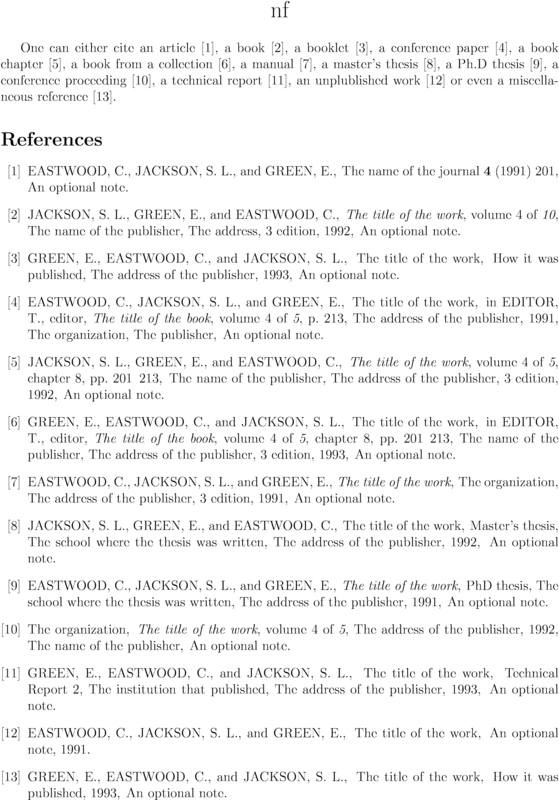 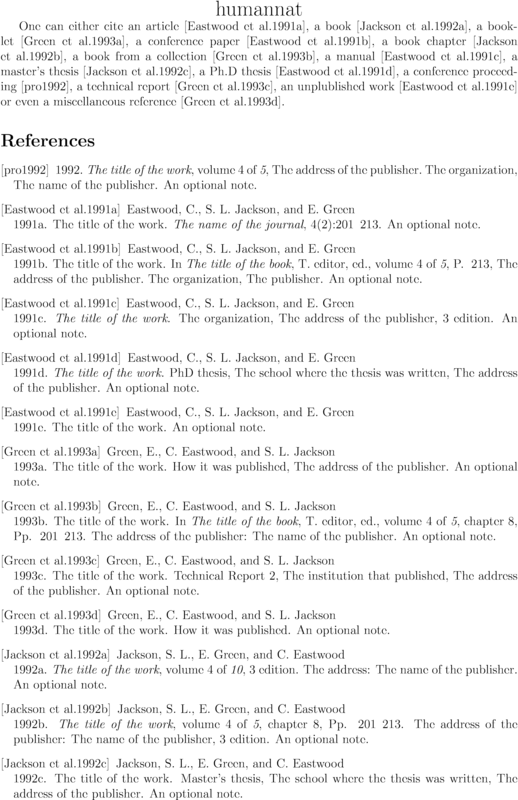 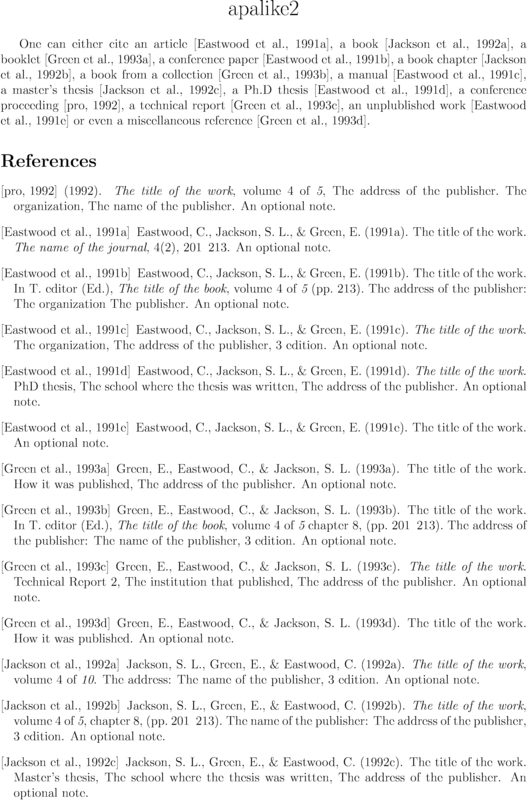 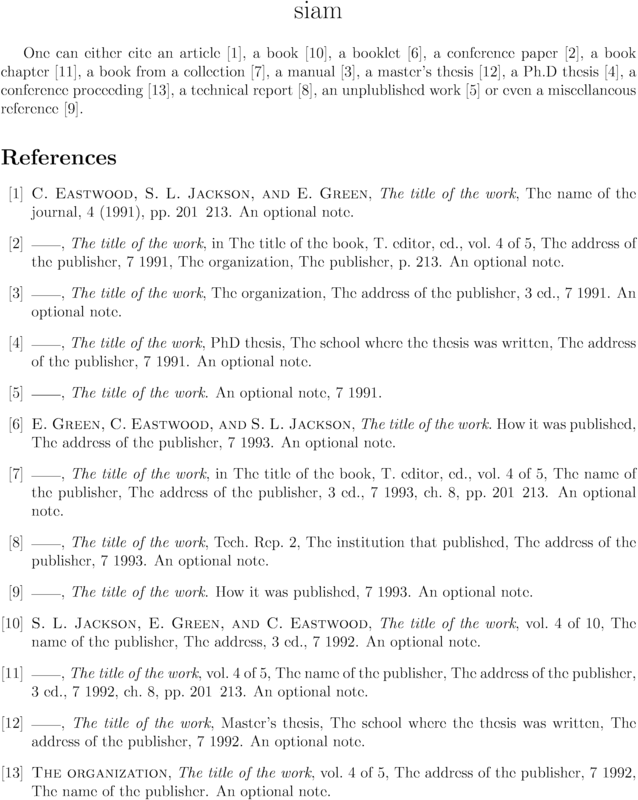 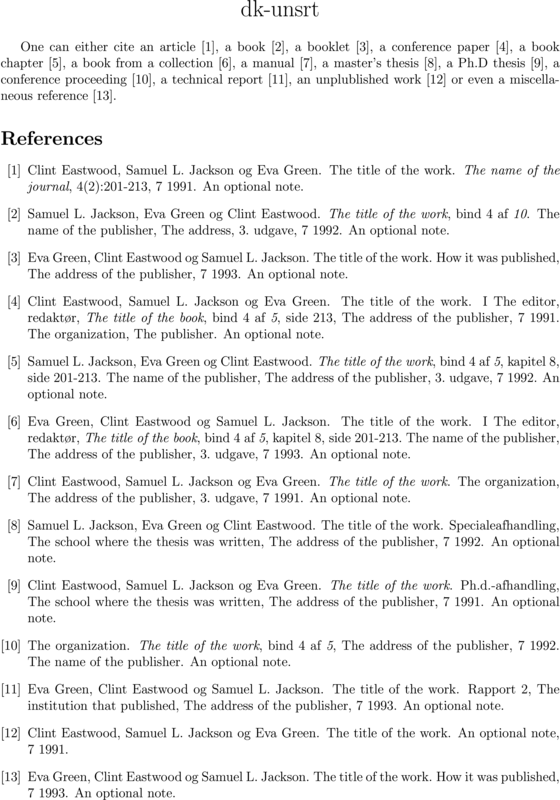 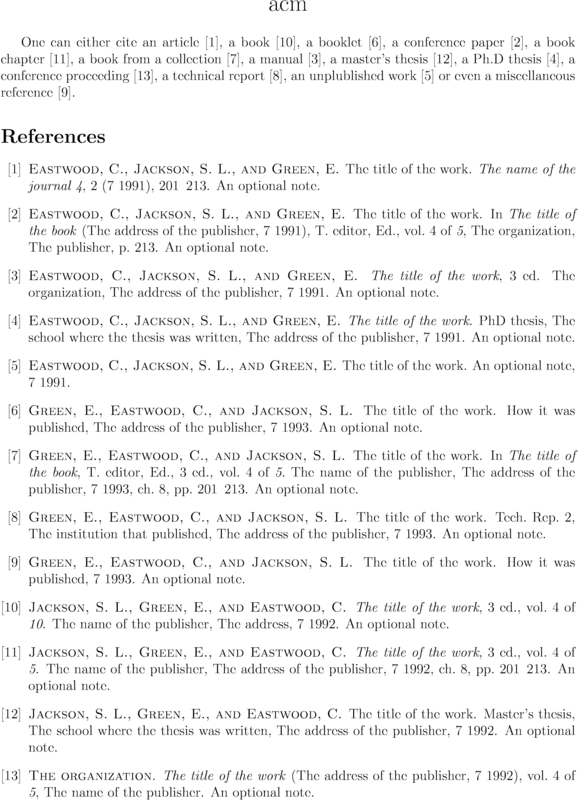 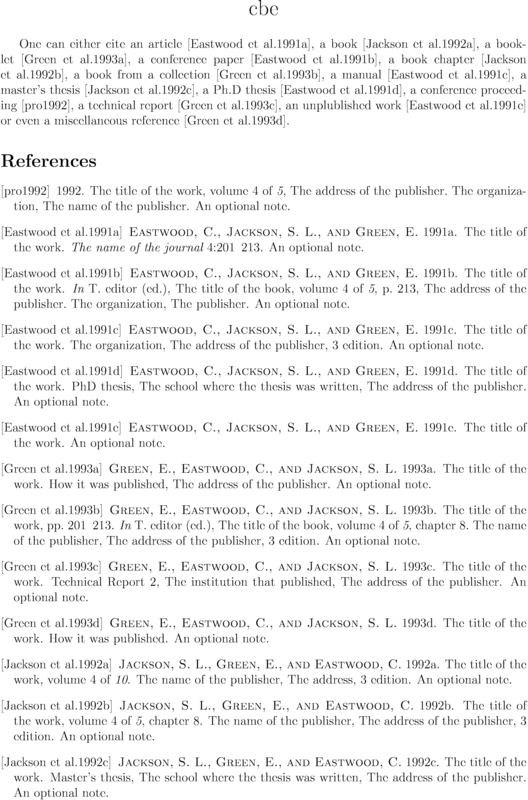 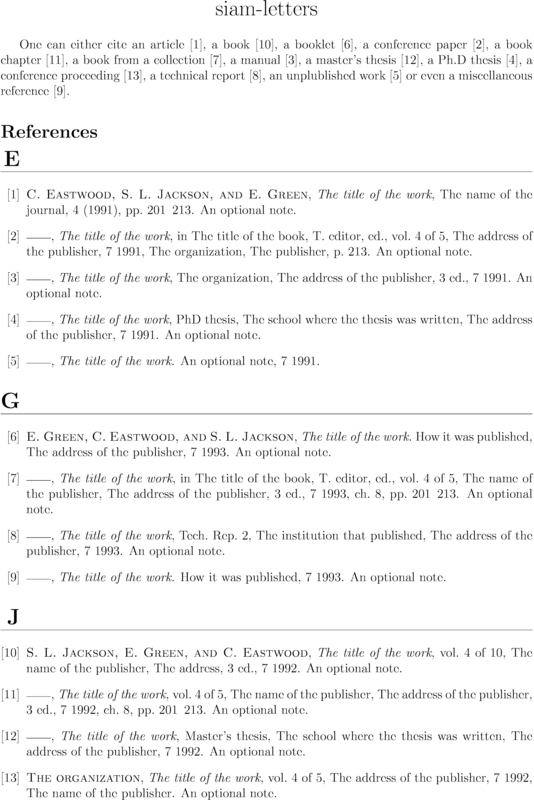 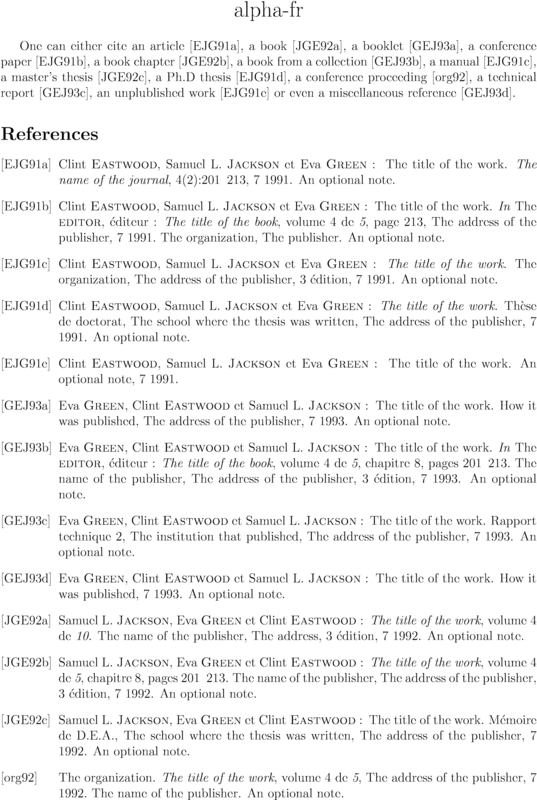 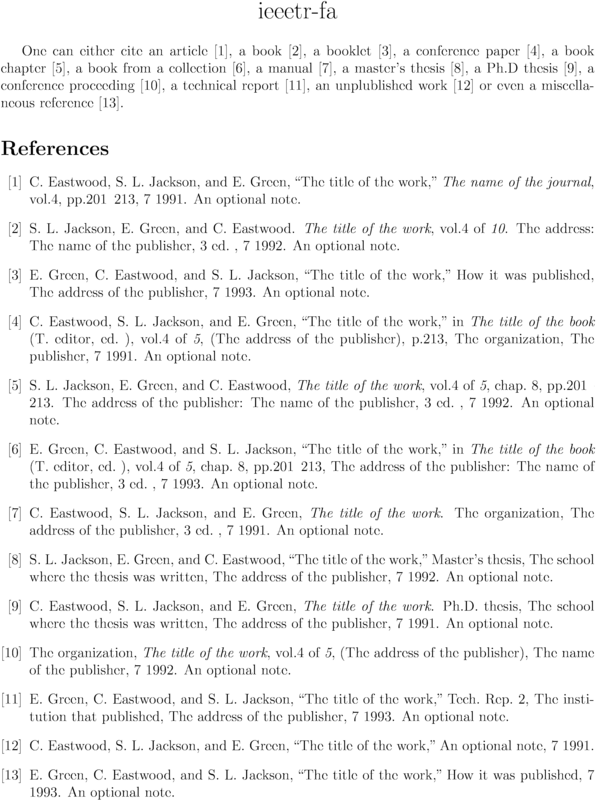 Here's a (very) partial collection of the bibliography styles available in BibTeX. 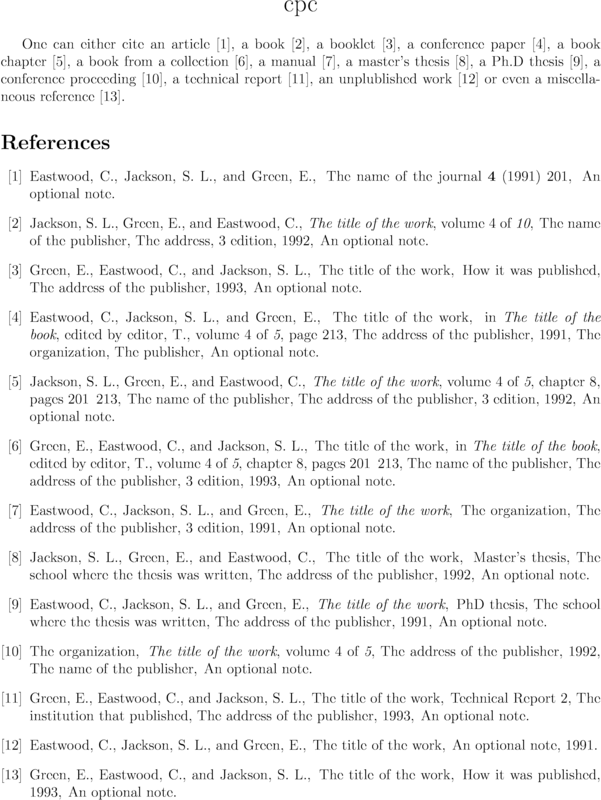 You can use the checkboxes to filter the data. 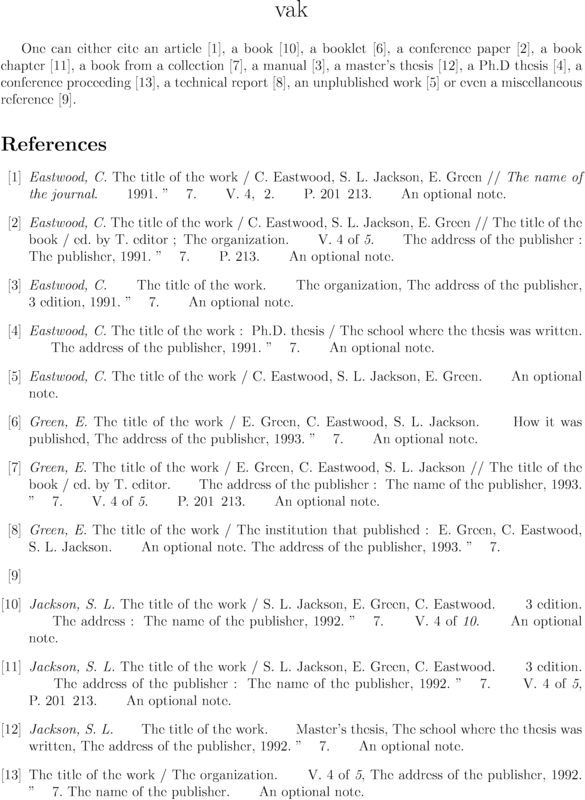 Click on any row to see the corresponding example. 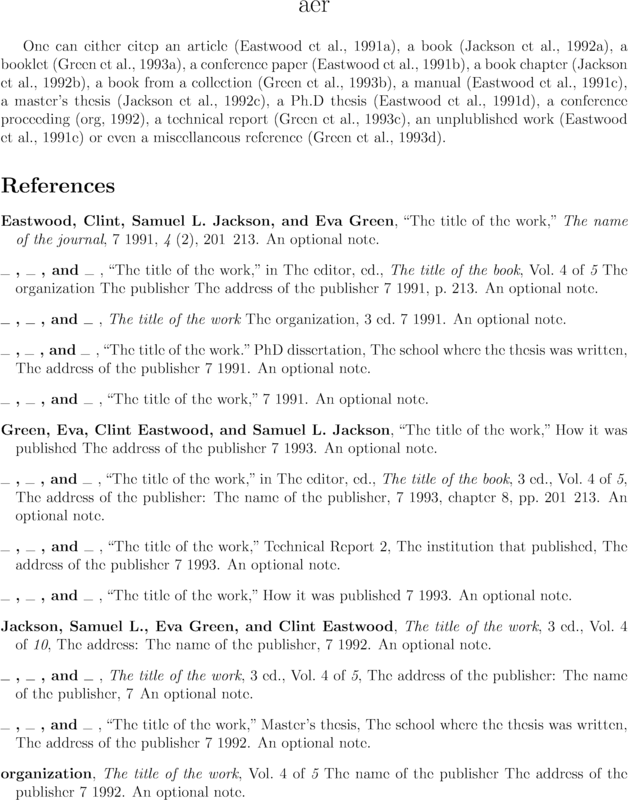 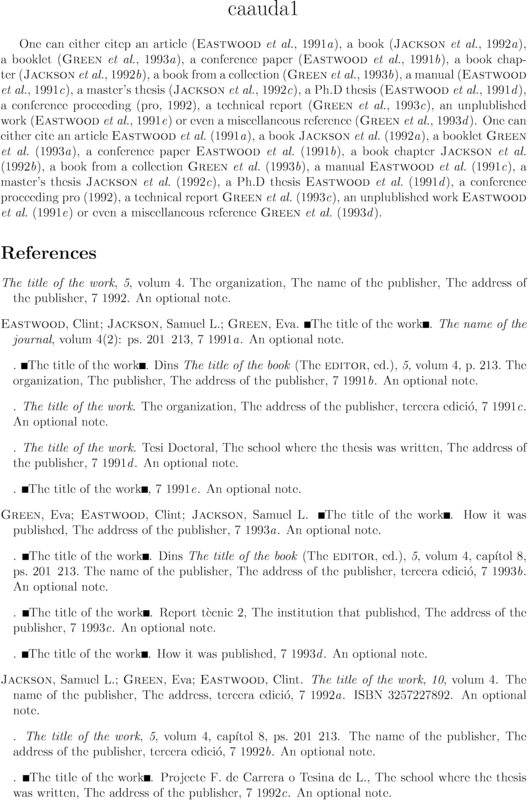 Some of the bibtex styles presented here require additionnal packages (such as natbib). 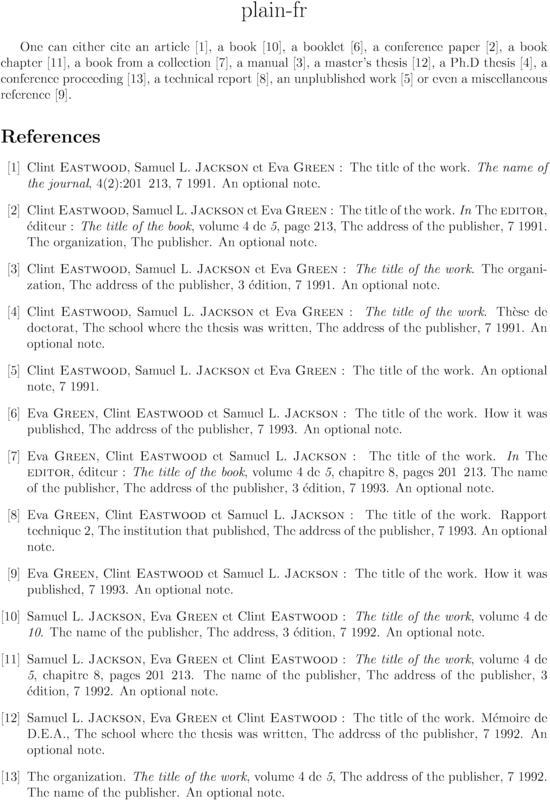 As a result, the rendering may change depending on the configuration of the whole document. 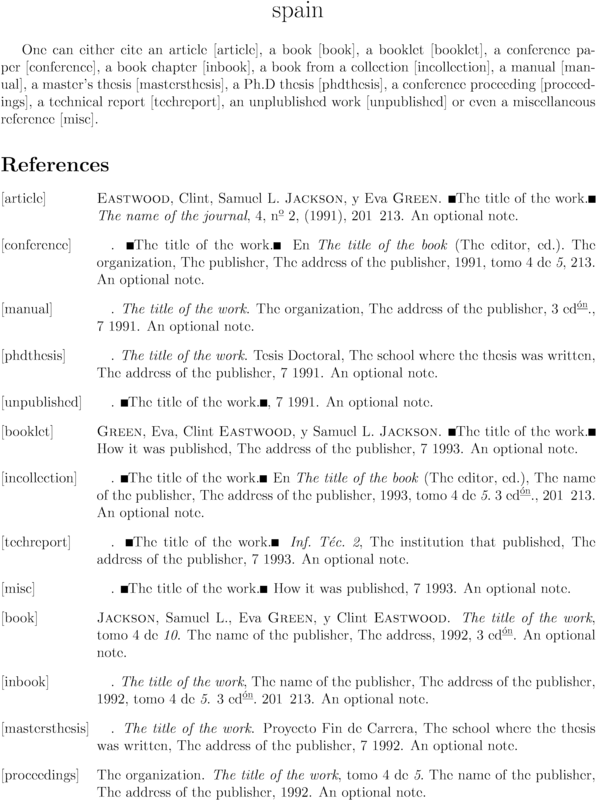 There are currently 123 entries in the Debibify's database. 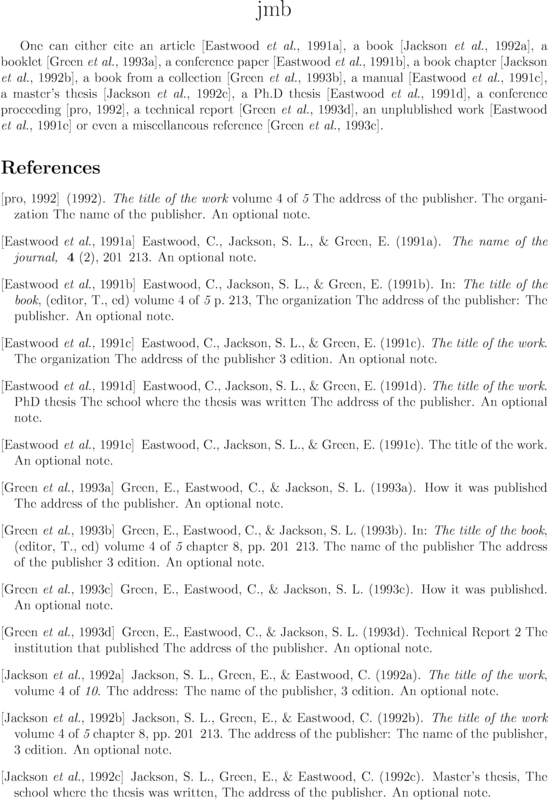 Page generated in 0.1689 seconds by PHP5/MySQL. 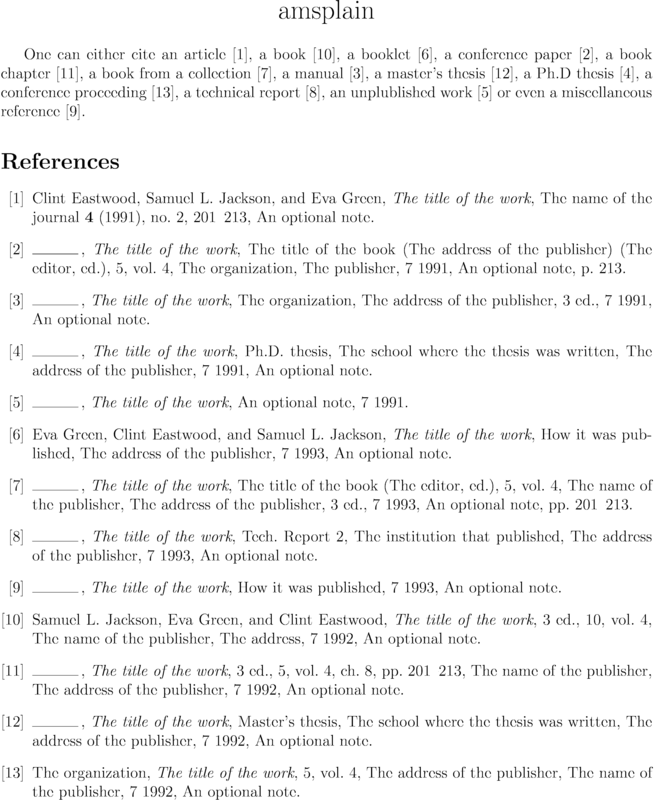 Please, briefly describe the error you want to report (mandatory). 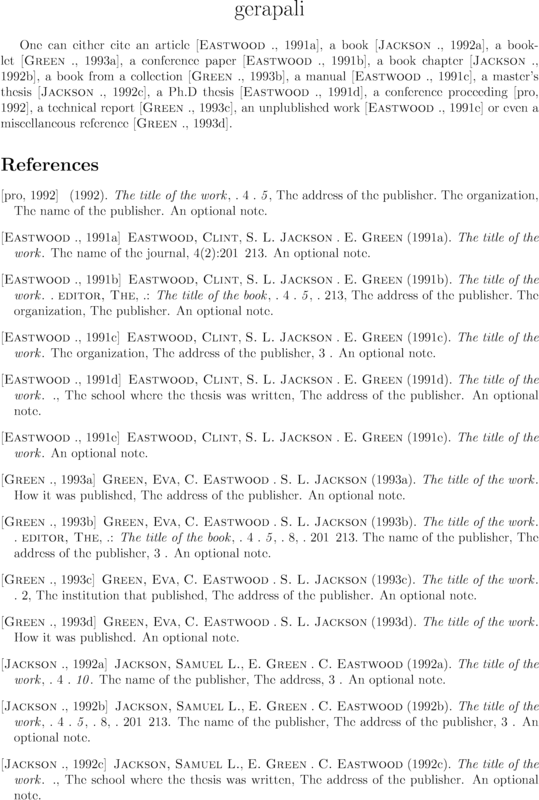 URLs are not allowed.